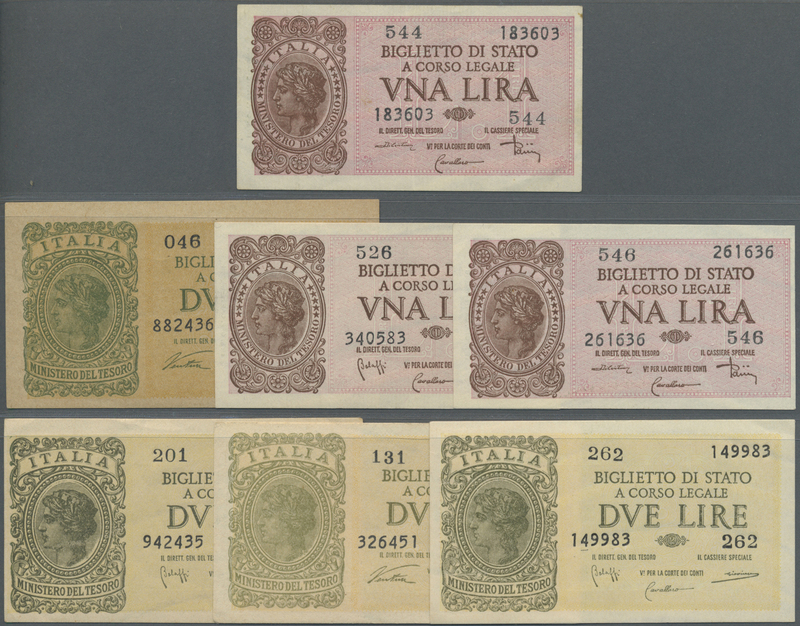 1790 Pick 3 500 Lire 1938 P. 3, used with light vertical and horizontal folds, no holes, upper border trimmed, probably pressed but no repairs, minor split at upper border center, still very nice colors, condition: pressed VF-. 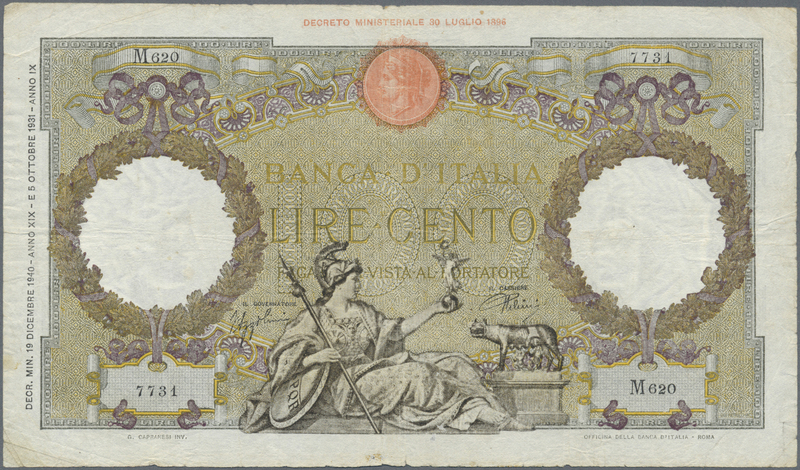 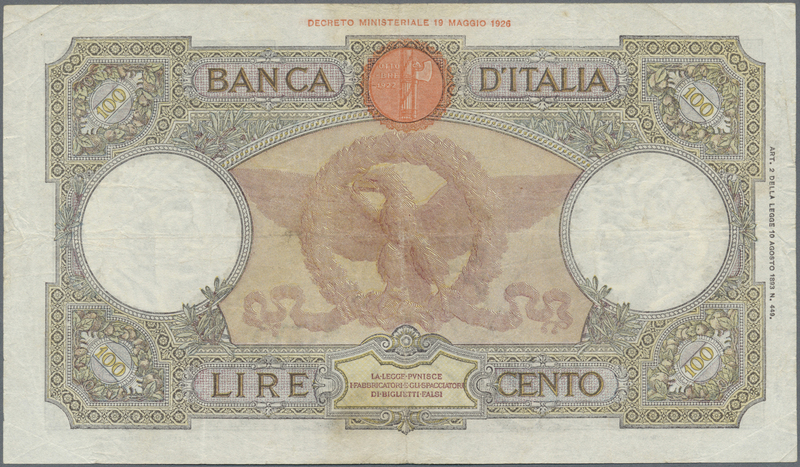 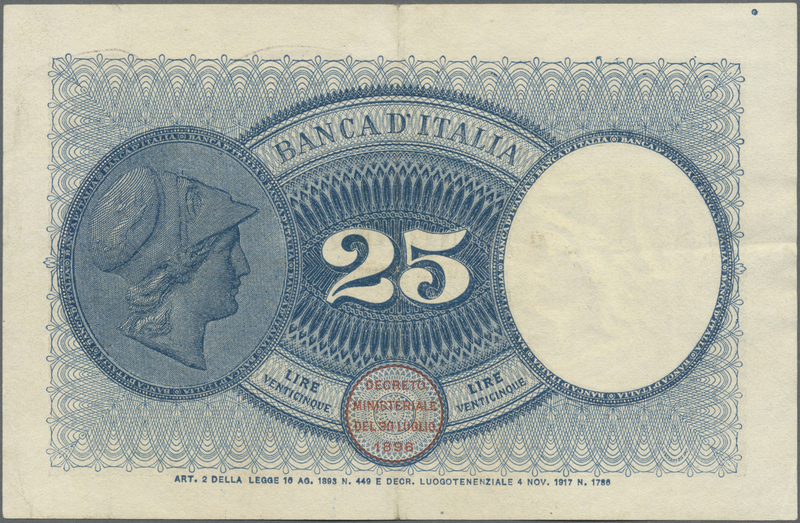 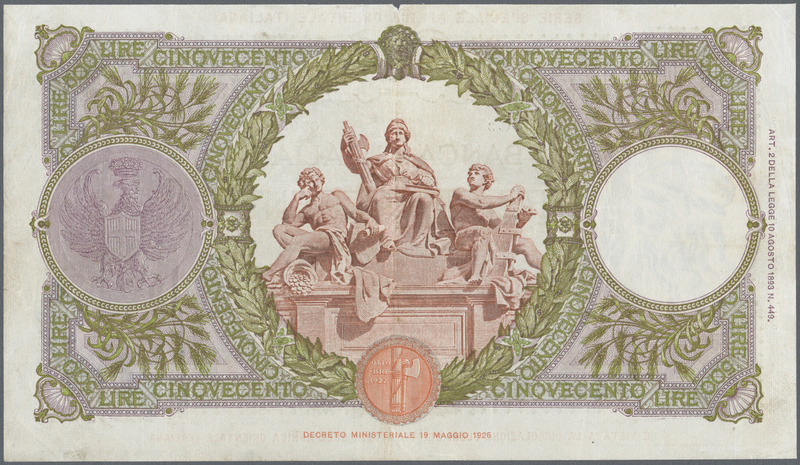 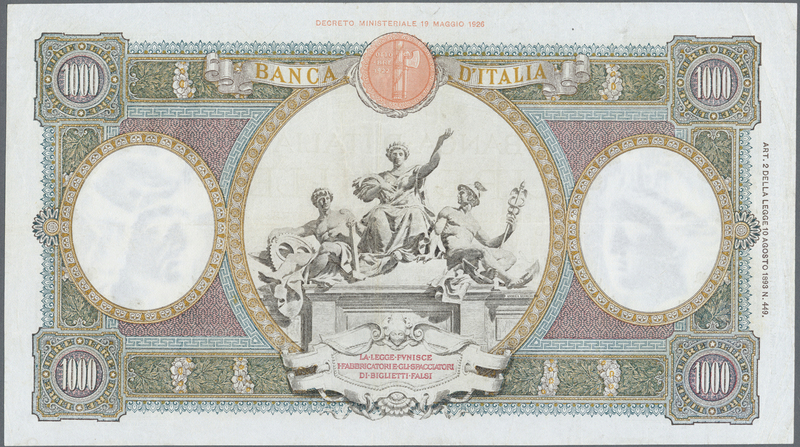 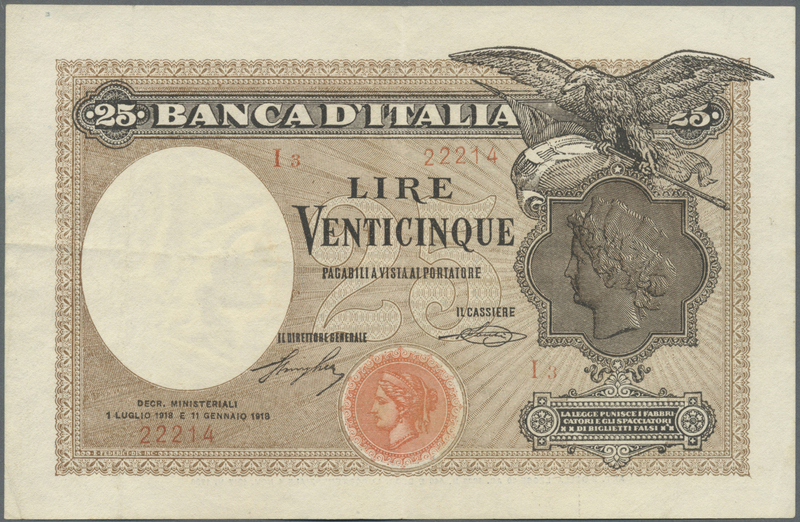 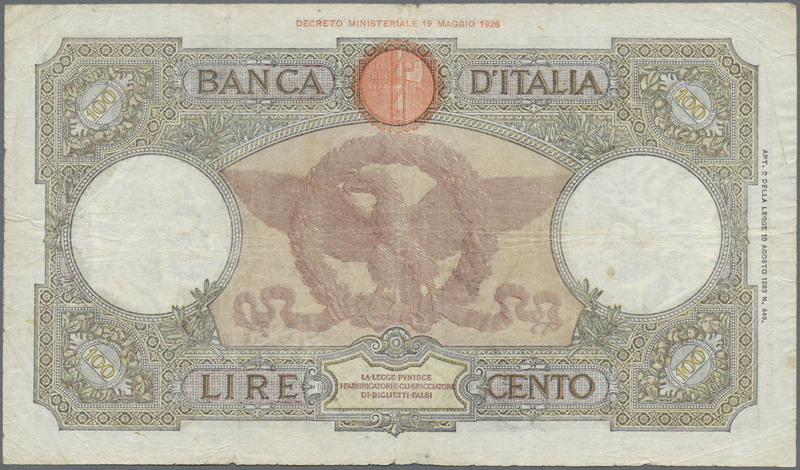 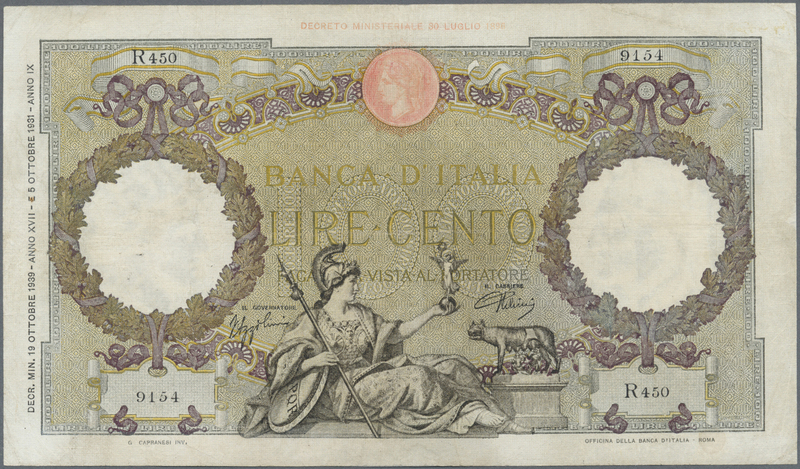 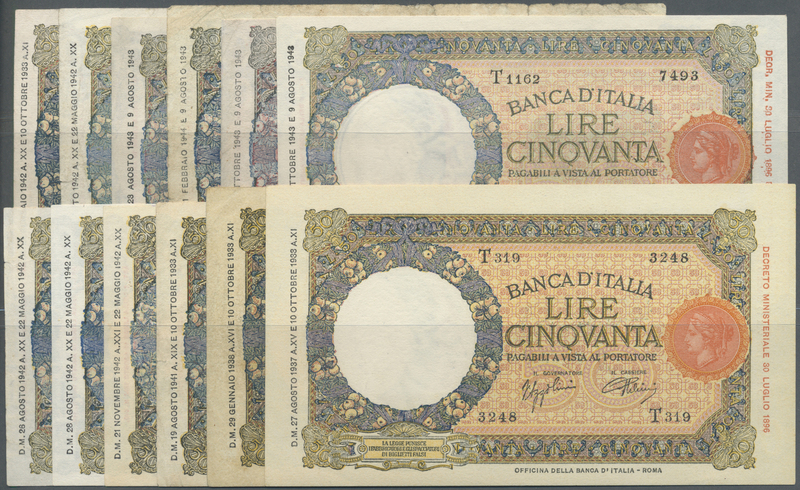 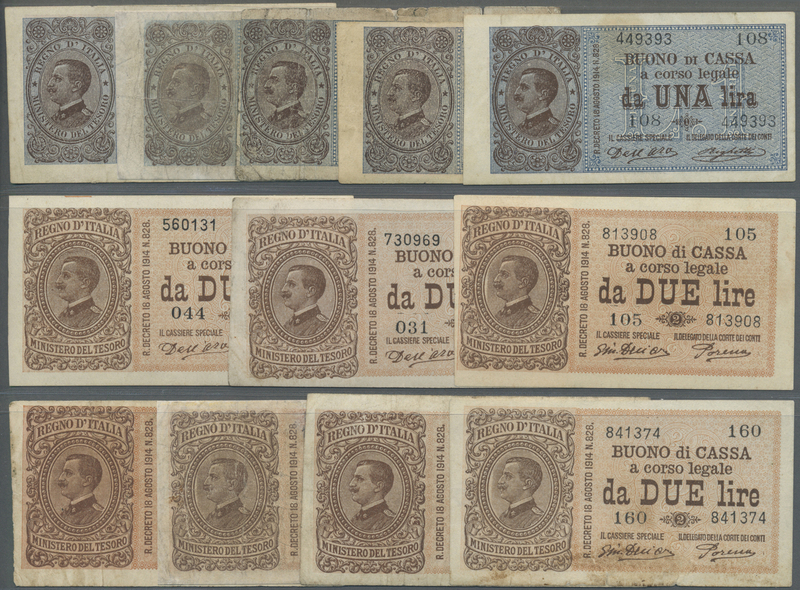 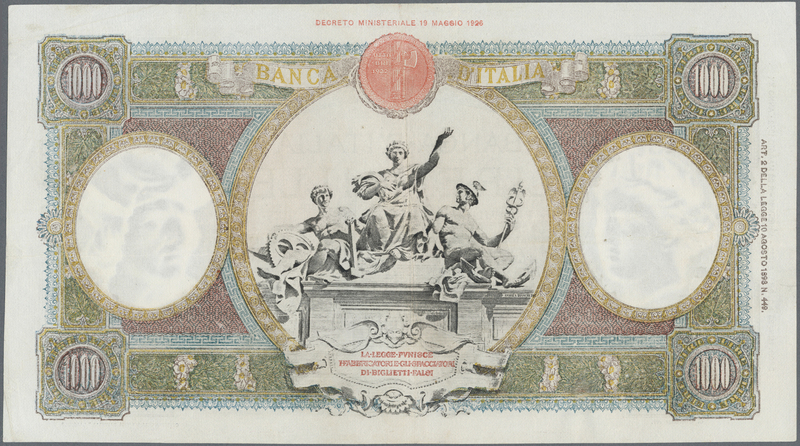 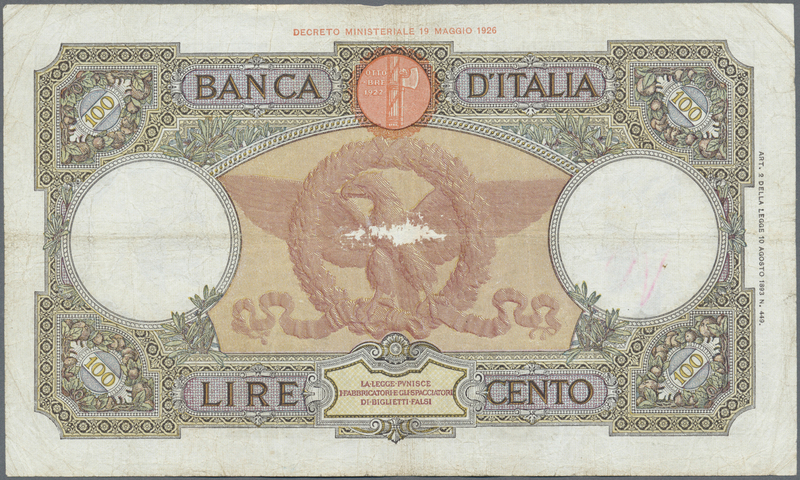 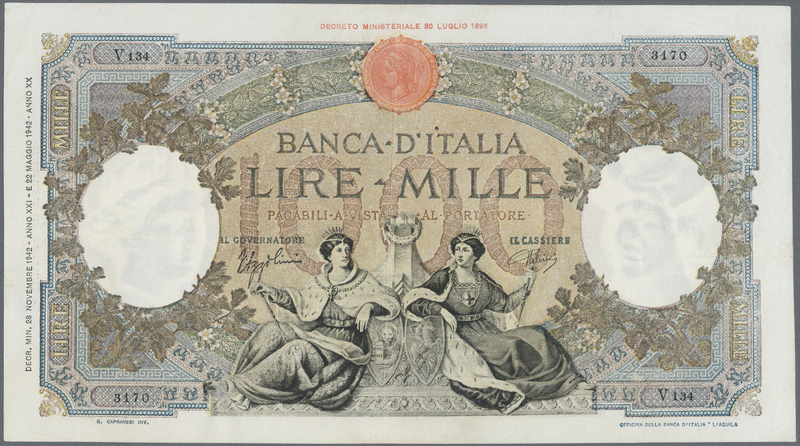 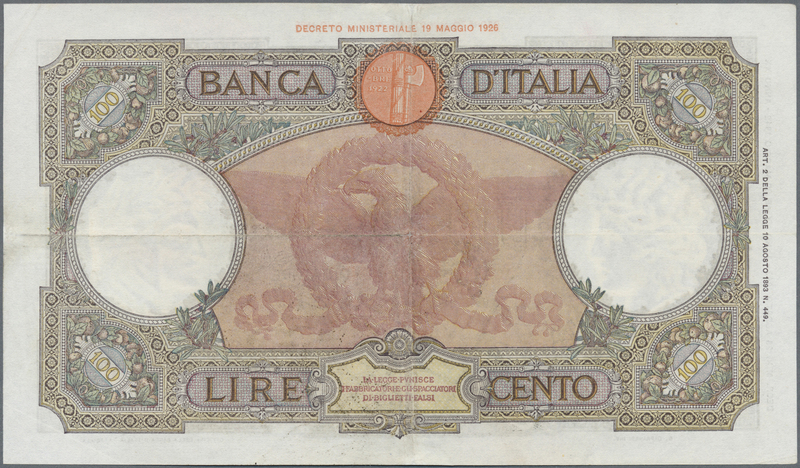 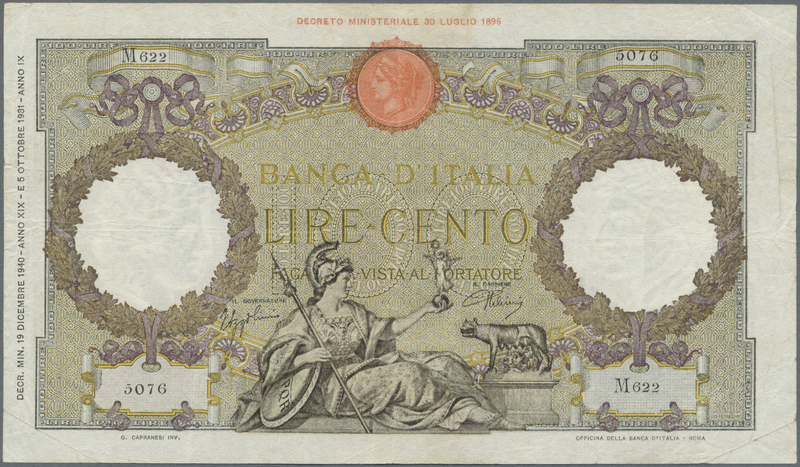 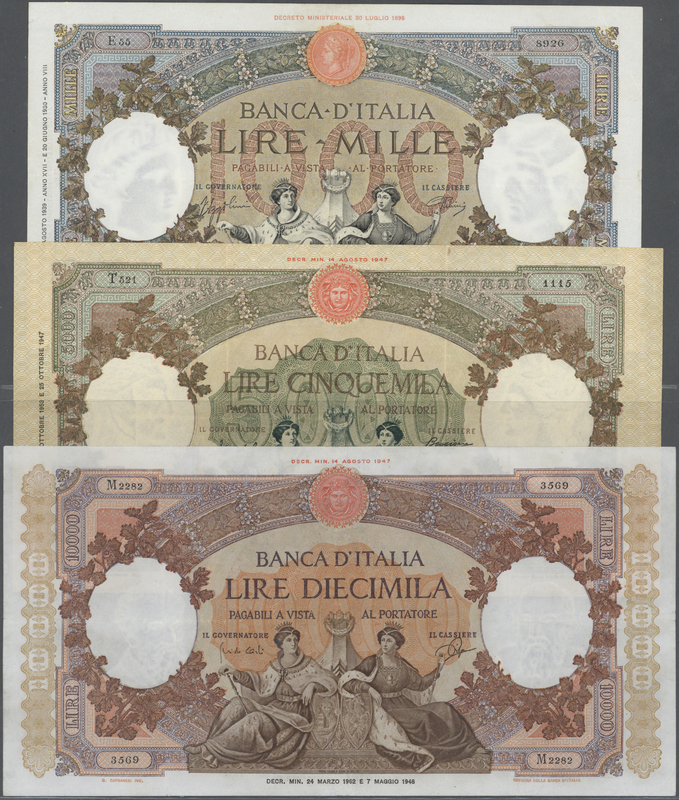 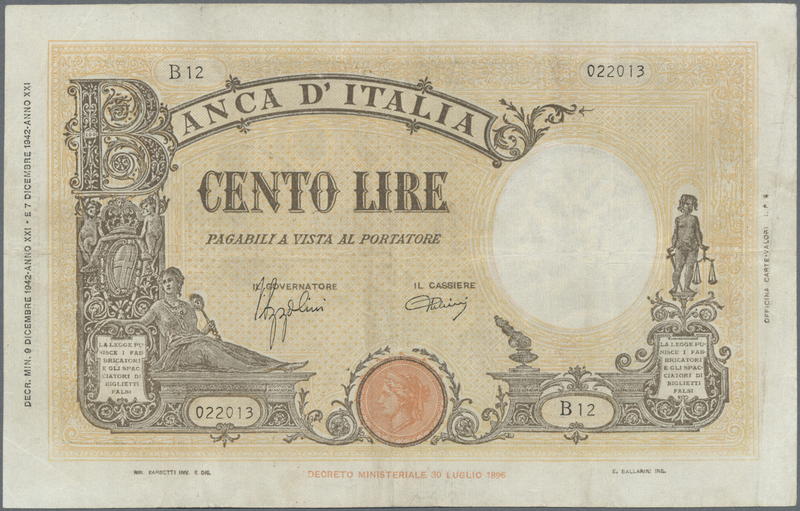 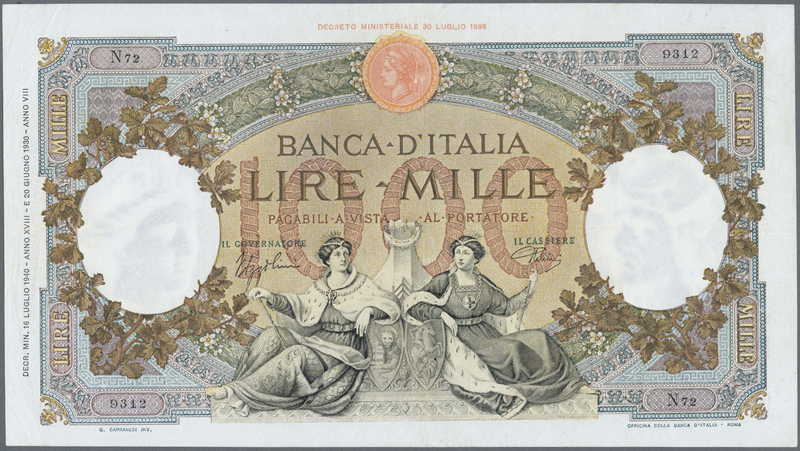 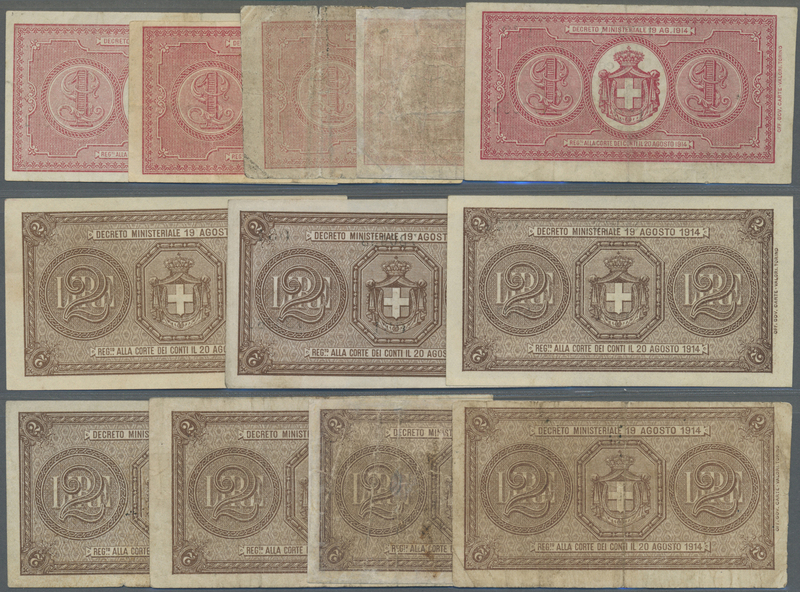 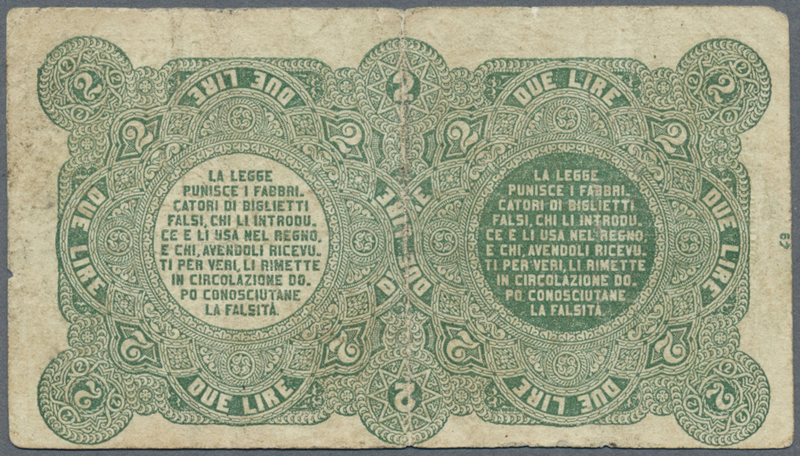 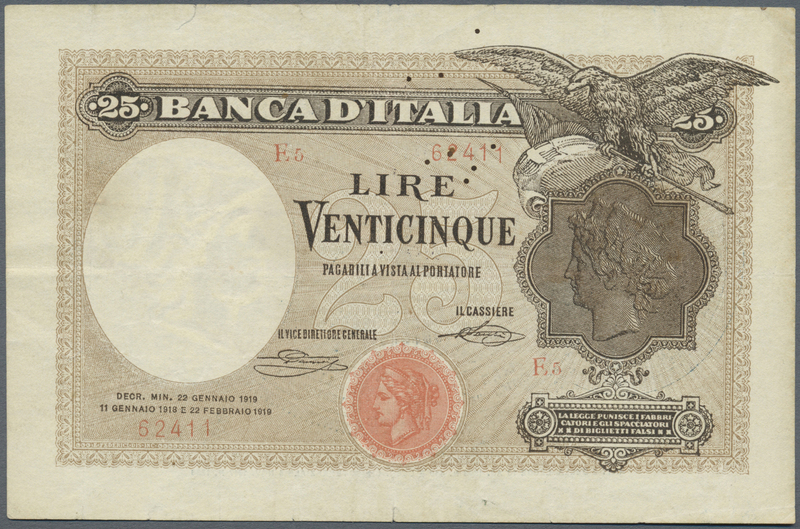 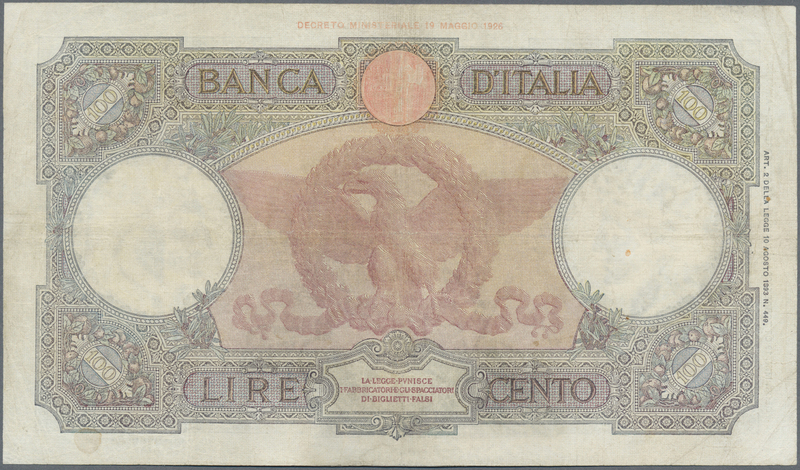 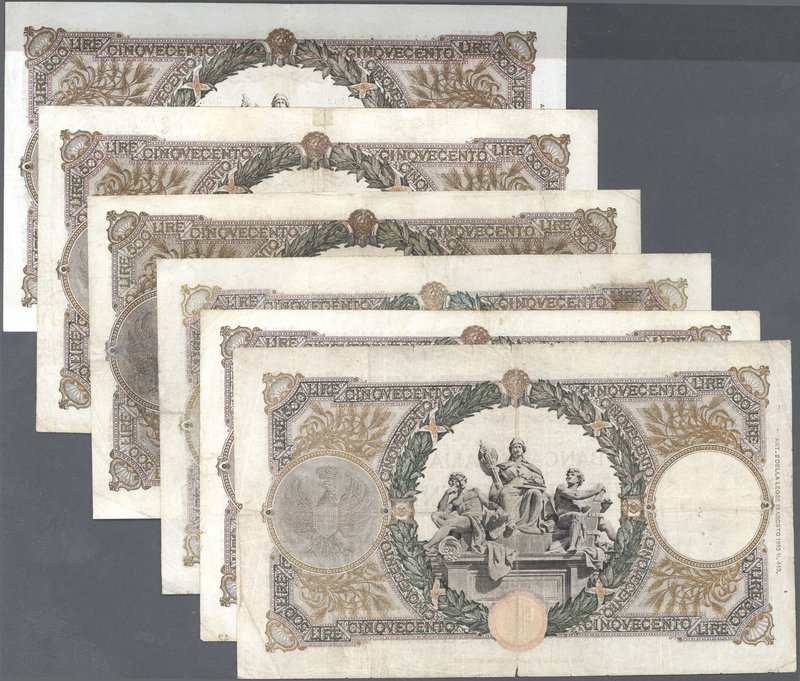 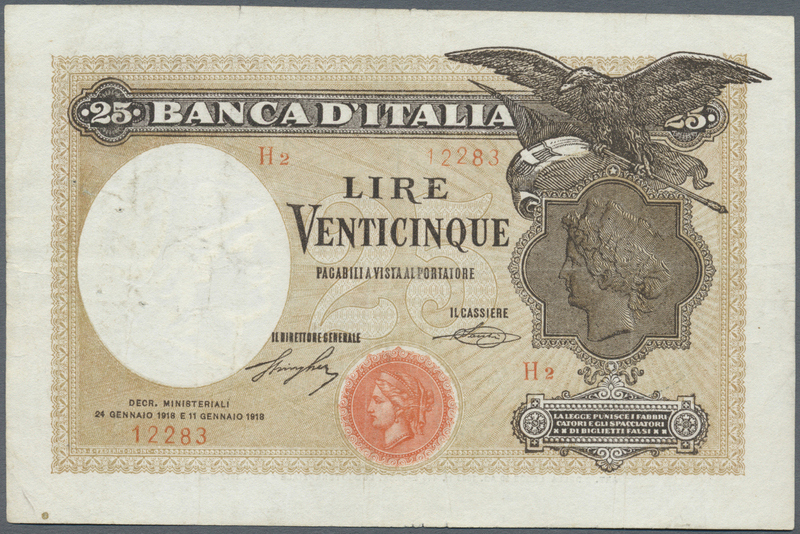 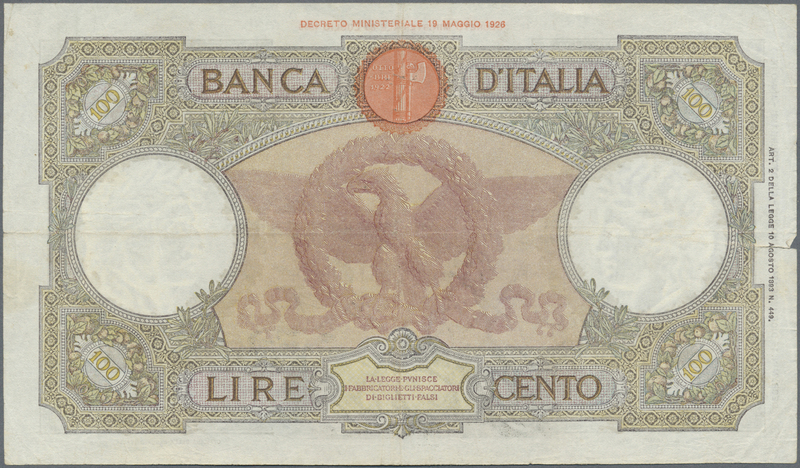 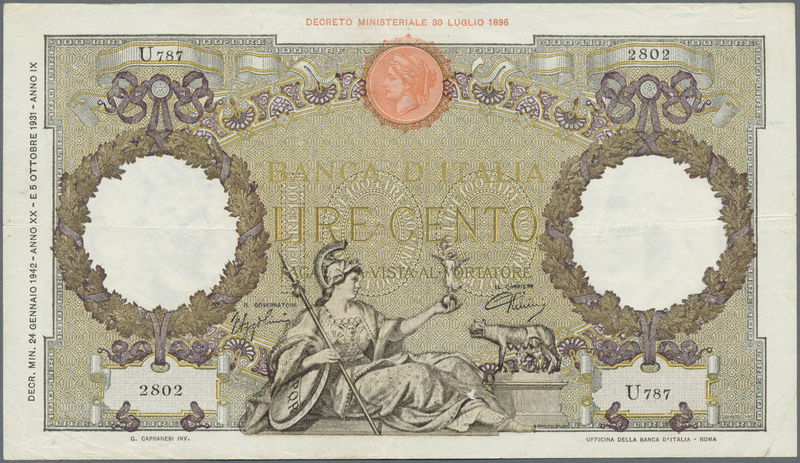 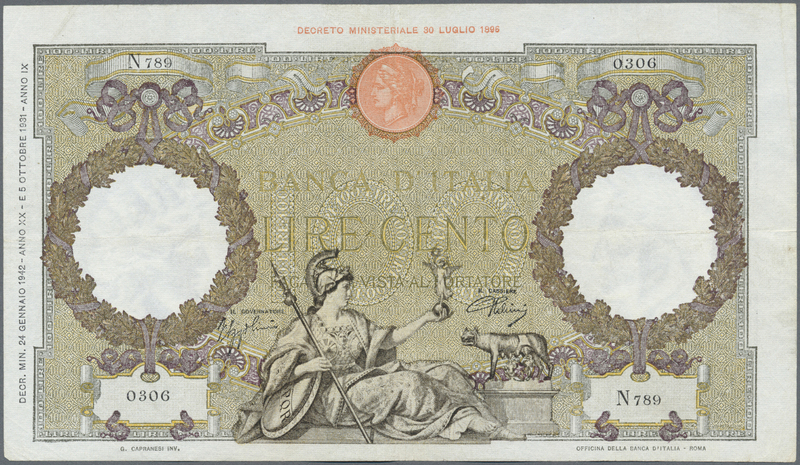 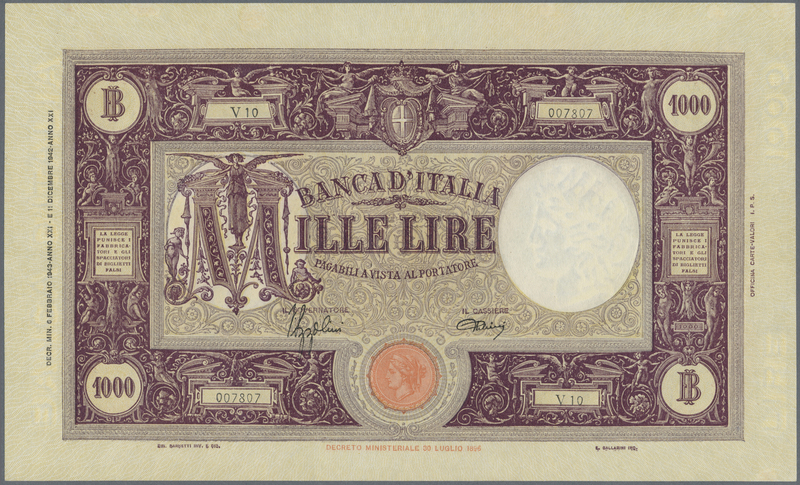 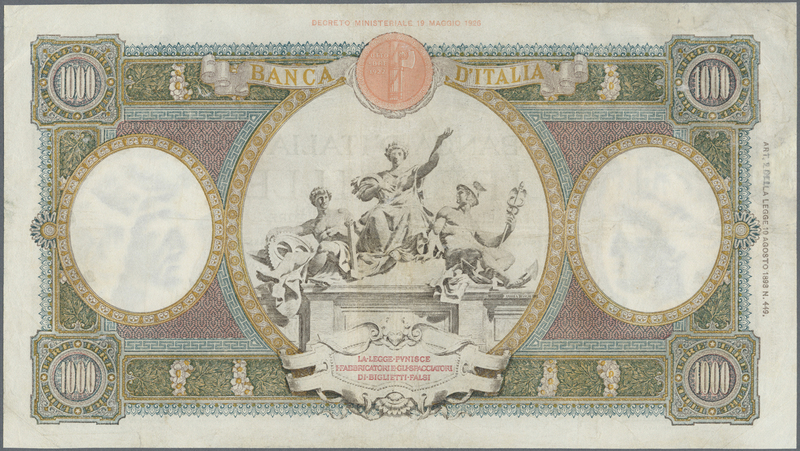 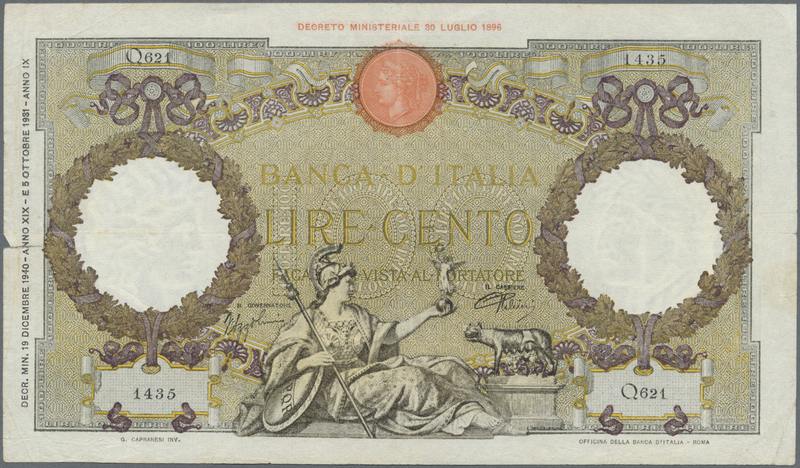 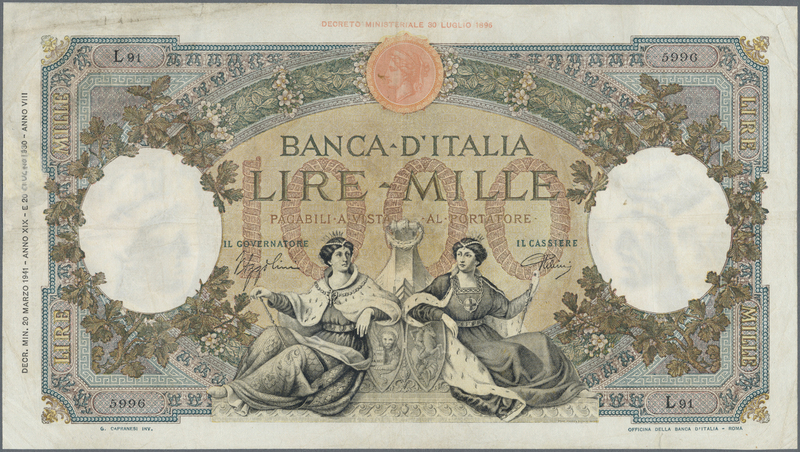 1792 Pick 3 2 Lire 1874 Biglietto Consorziale P. 3, used with center fold and light stain in paper, no holes, no repairs, condition: VF. 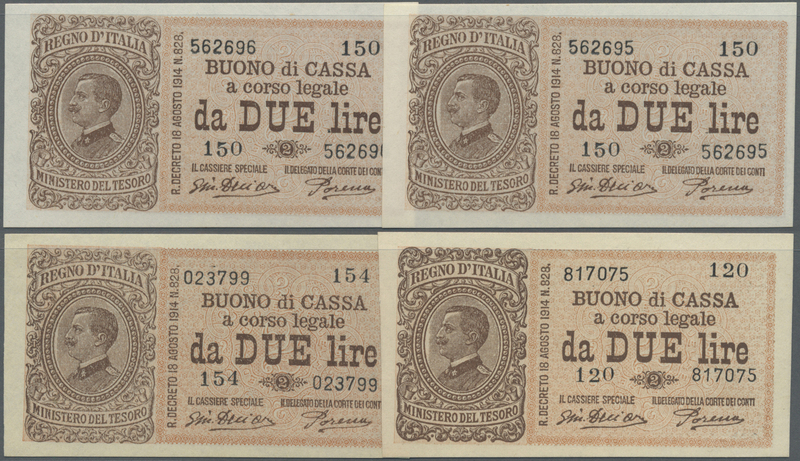 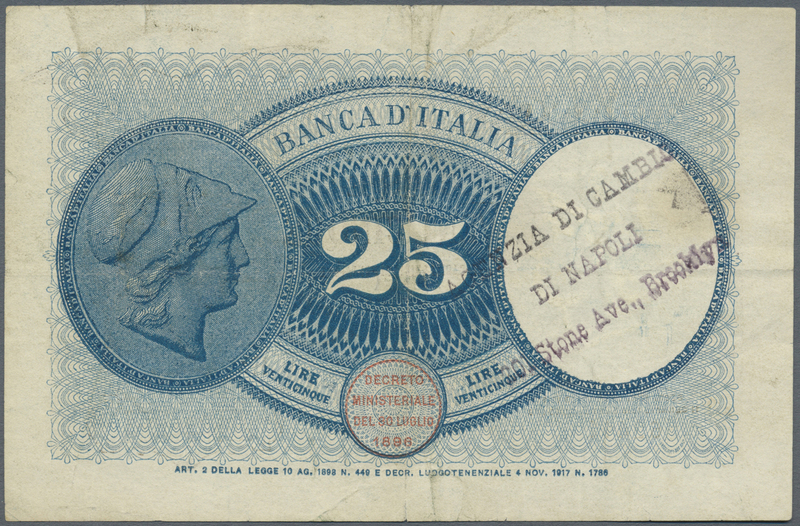 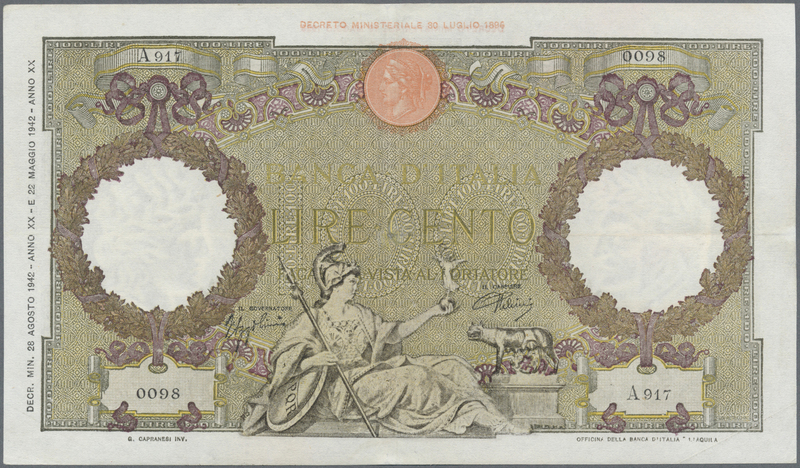 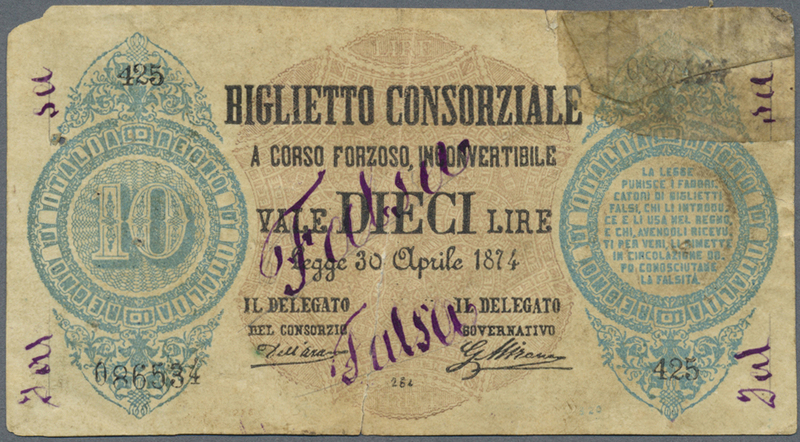 1794 Pick 5 Forgery rare contemporary forgery of Biglietto Consorziale 10 Lire 1874 P. 5(f), marked several times as "falsa" by the bank, half torn into the center, upper right stained, minor missing part at upper left, rare collectible for any italian collection, condition: G+ to VG. 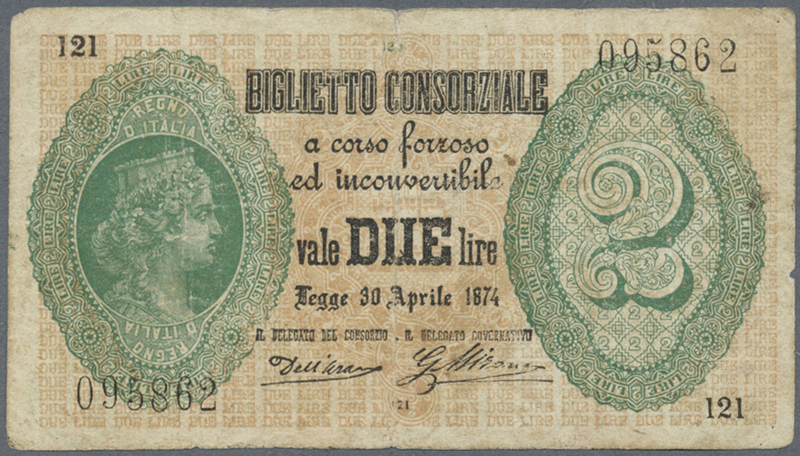 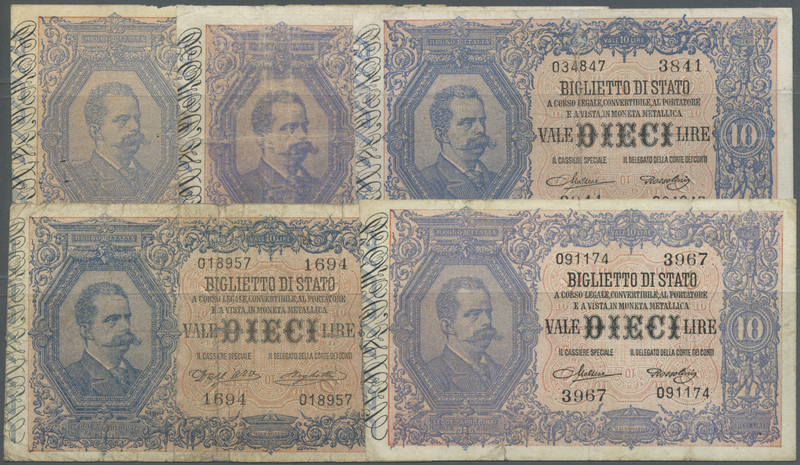 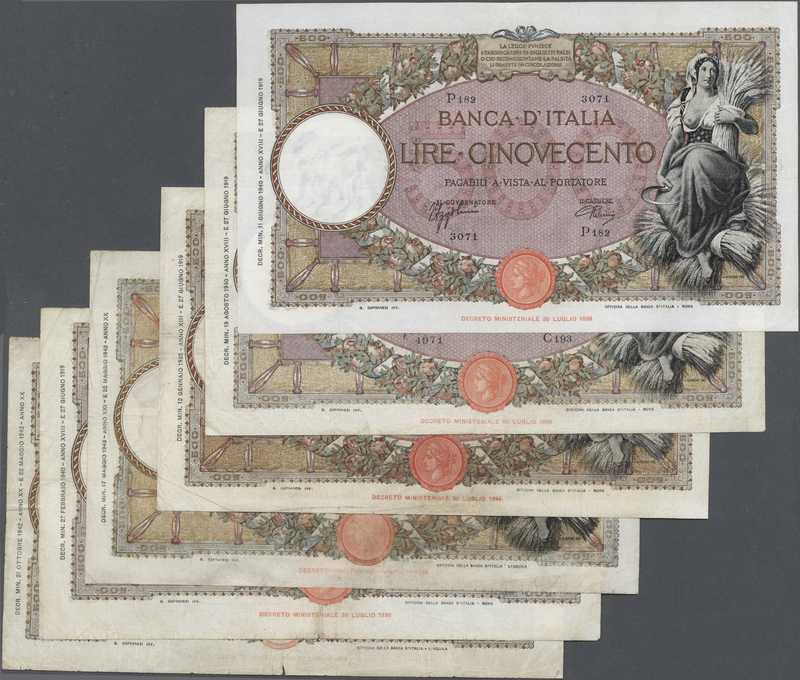 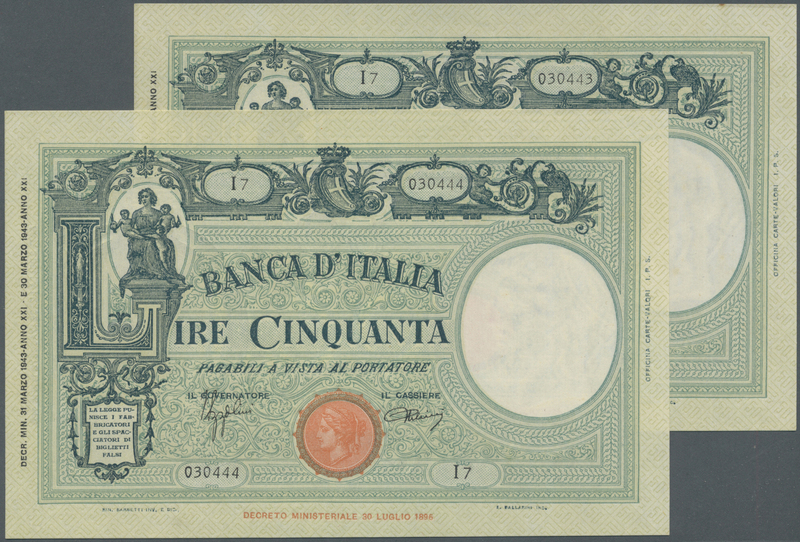 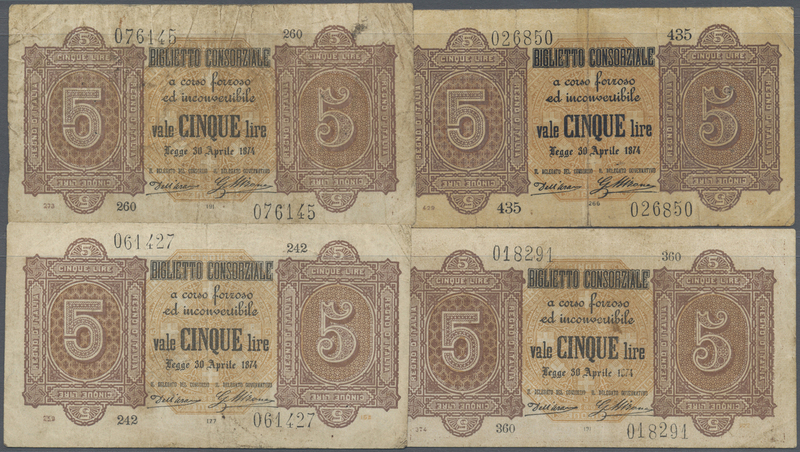 1795 Pick 11 2 Lire 1881 Biglietto Gia'Consorziale P. 11, rare note with only one pinhole, crisp paper and original colors, condition: aUNC. 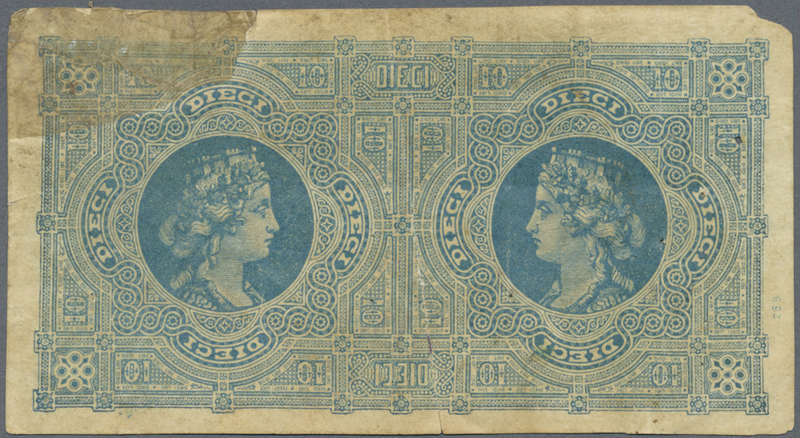 1799 Pick 20d 10 Lire 1888 P. 20d, used with folds and stain in paper, pressed, no holes or tears, traces of use visible in design, condition: F to F+. 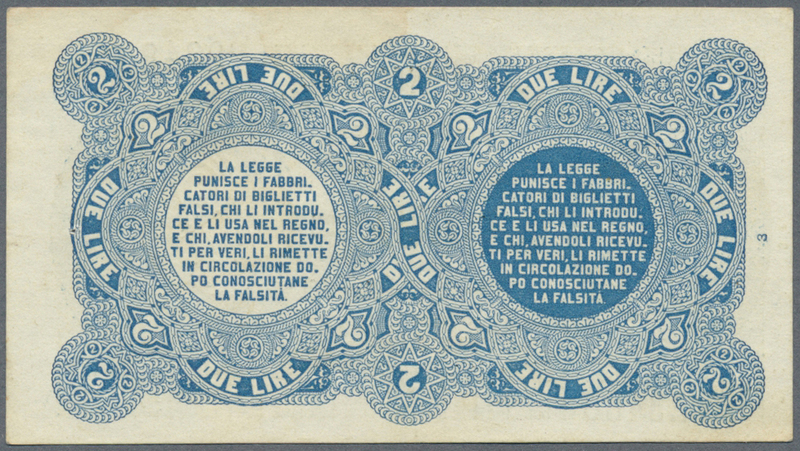 1800 Pick 20g 10 Lire 1888 P. 20g, washed and pressed but still with strong paper, nice colors, no tears, no holes, nice optical appearance, condition: pressed XF+. 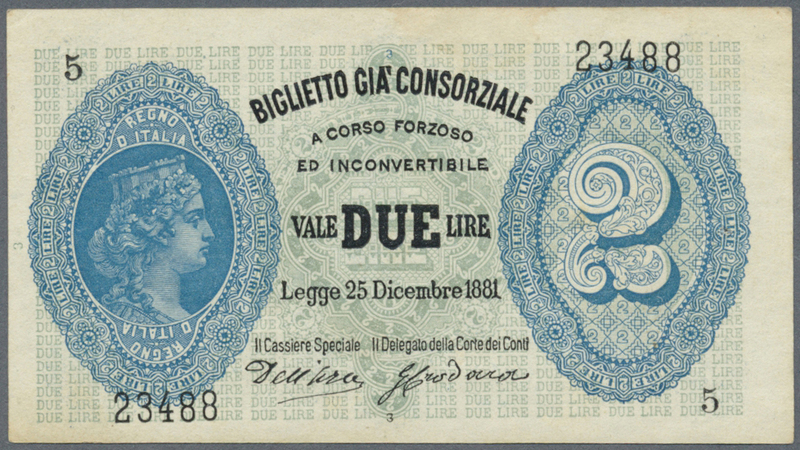 1803 Pick 35 2 Lire 1894 P. 35, folds in paper, pressed but still strong paper and original colors, no holes, condition: pressed F+ to VF-. 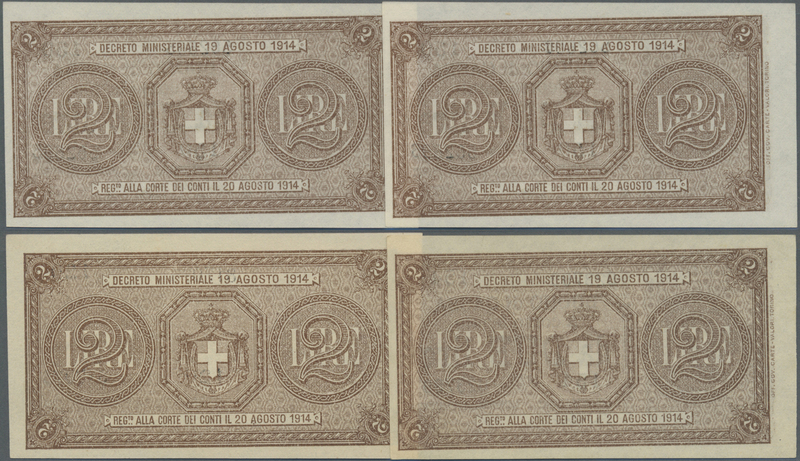 1807 Pick 42 rare banknote of 25 Lire 1918 P. 42 in exceptional condition with light center and horizontal fold, light dints in paper, no holes or tears, paper very crisp original and with bright colors, no repairs, condition: XF. 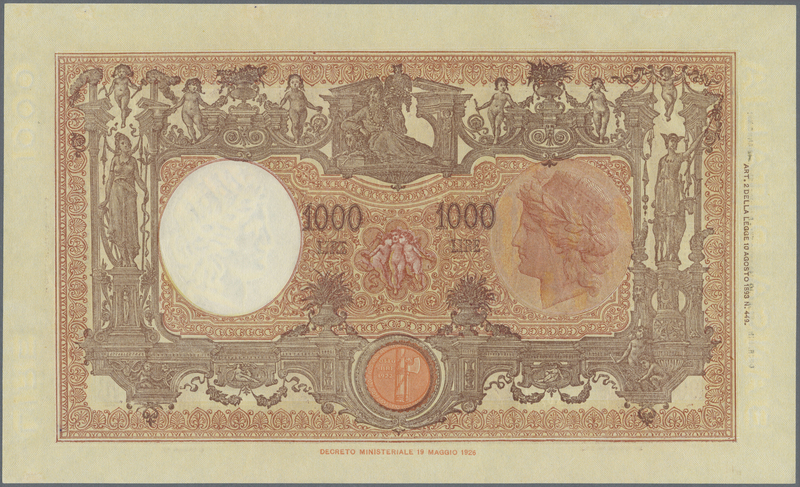 1811 Pick 50 100 Lire 1930 P. 50, pressed with wavy paper at borders but no holes or tears, no strong folds, original colors and still some crispness left in paper, condition: pressed XF. 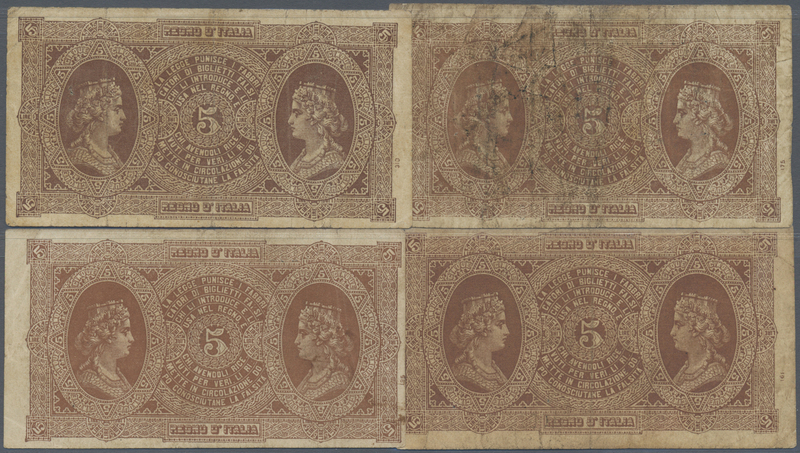 1813 Pick 50a 100 Lire 1927 P. 50a, used with several folds, stains, border tears, pressed, early date for this issue, condition: F-. 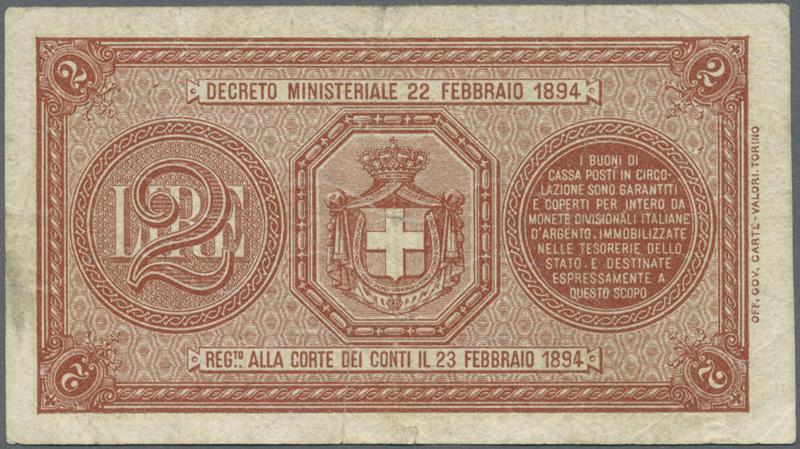 1815 Pick 51c 500 Lire 1935 P. 51c, nice original colors note, crispness in paper, not washed or pressed, one 1,5cm border tear at right, no repairs, no holes, original paper quality, condition: VF+. 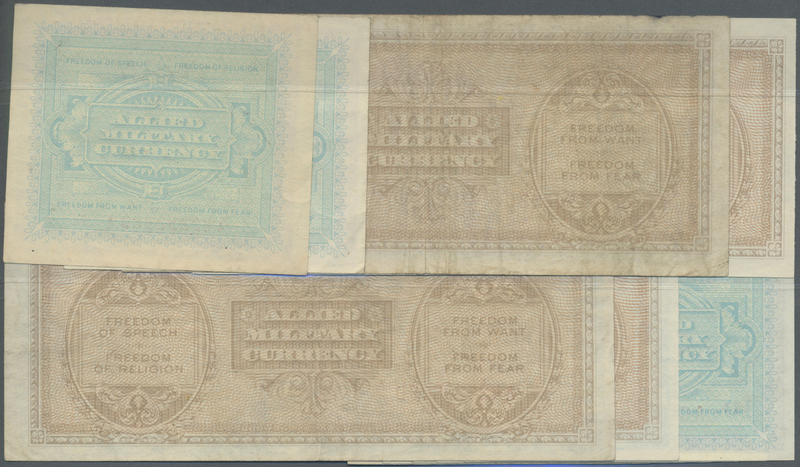 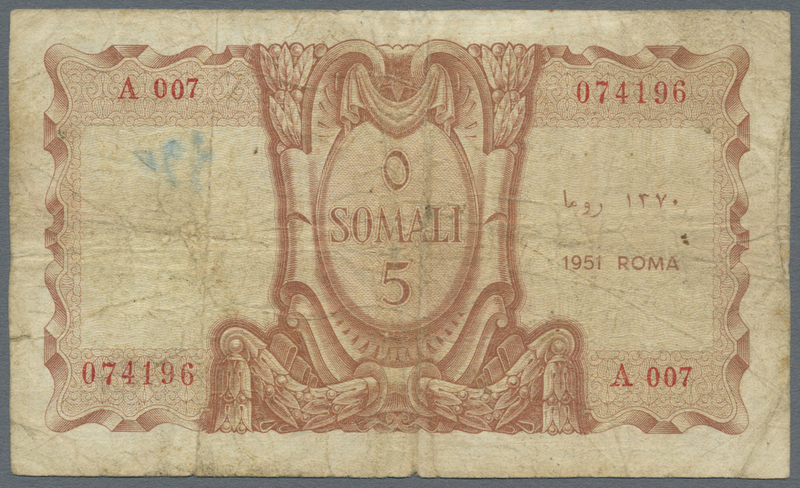 1816 Pick 51d 500 Lire 1940 P. 51d, only light folds in paper, probably pressed but still very crisp original paper and color, minor cut along upper border but no holes or tears, seldom seen condition for this type of note: pressed VF+. 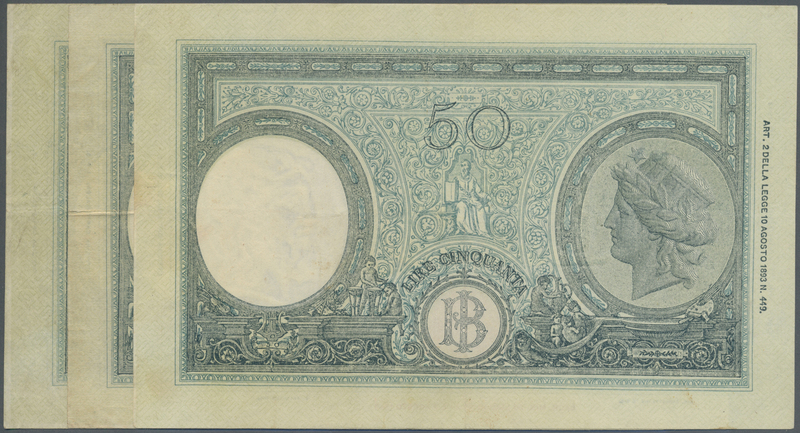 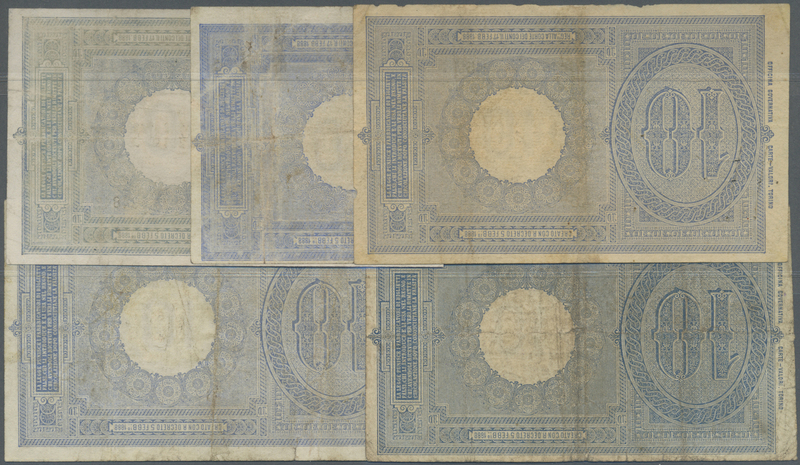 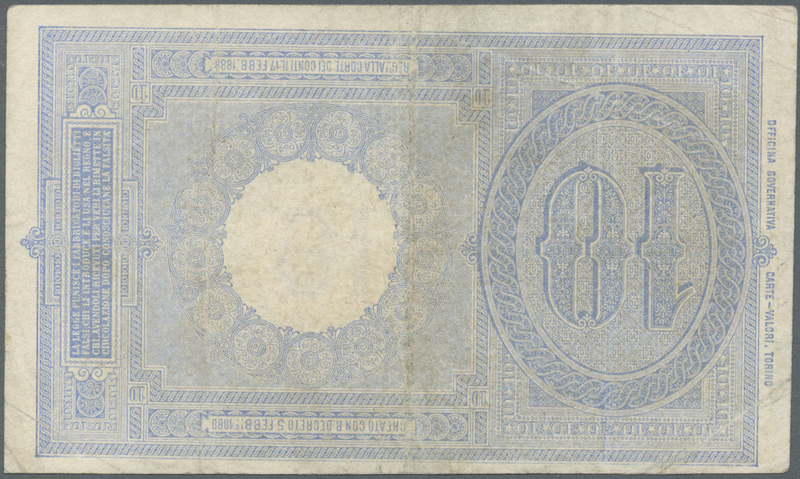 1818 Pick 54b 50 Lire 1938 P. 54b, crisp original paper, not washed or pressed, original colors, no holes or tears, exceptional condition for this type of note, condition: UNC. 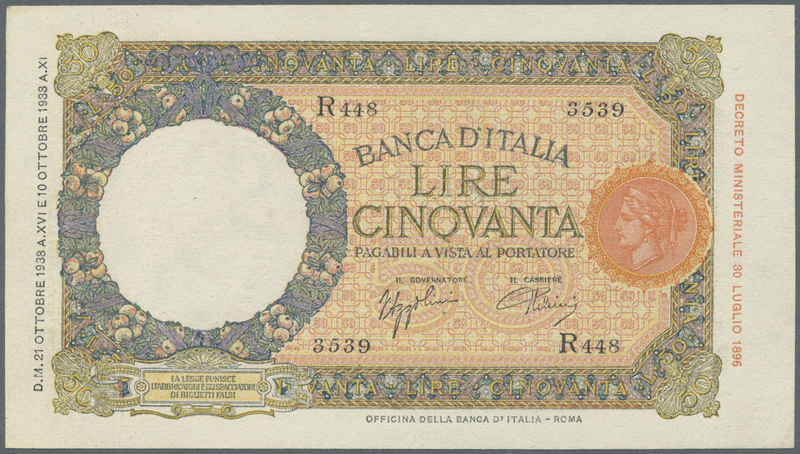 1823 Pick 56c 1000 Lire 1940 P. 56c, used with folds but pressed, no holes, still strongness in paper and nice colors, beautiful classic design note in conditoin: pressed VF+. 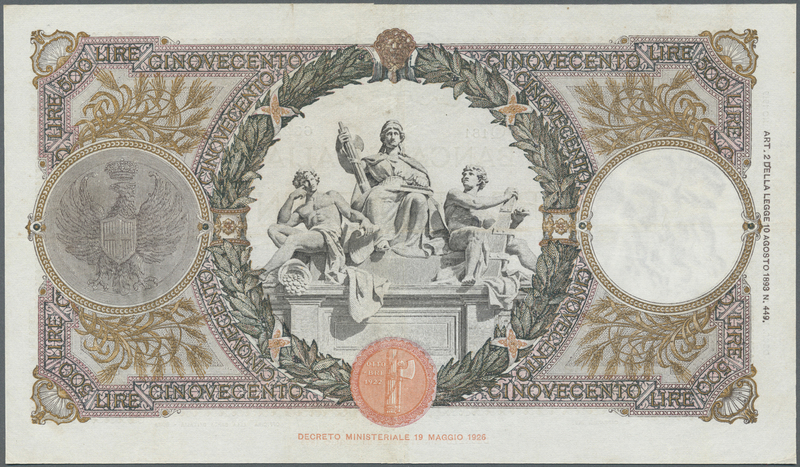 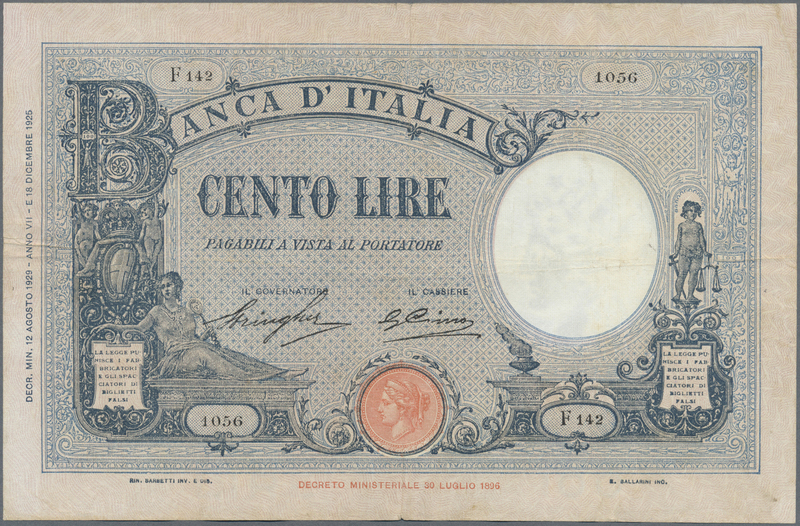 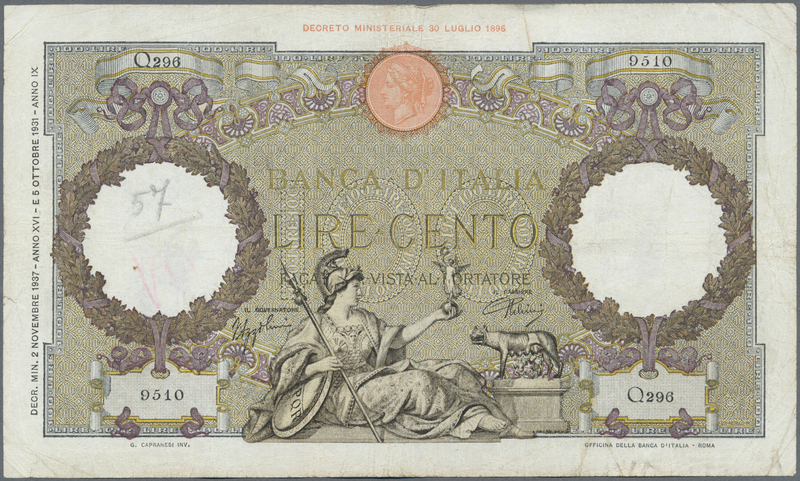 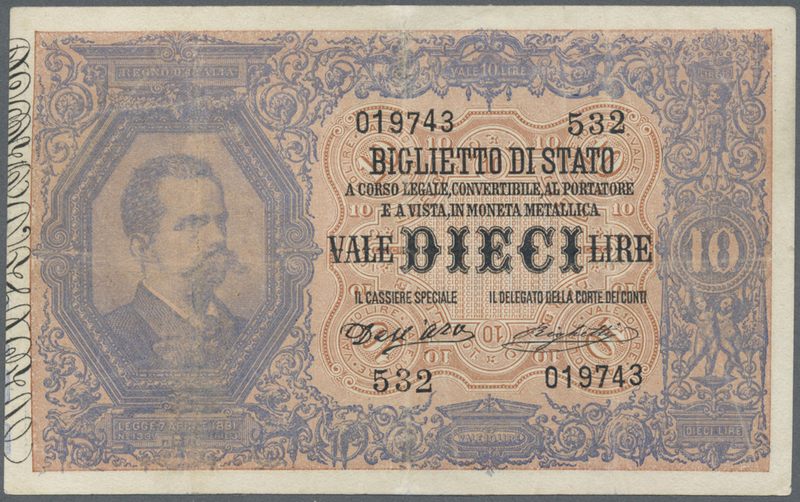 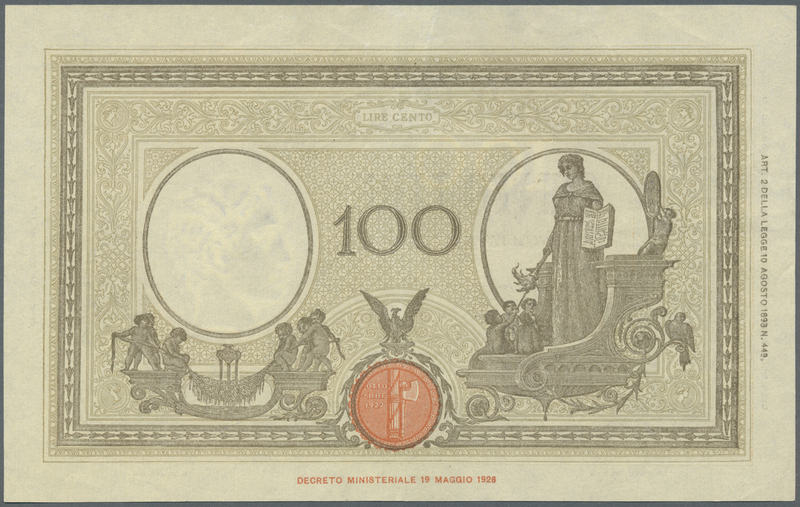 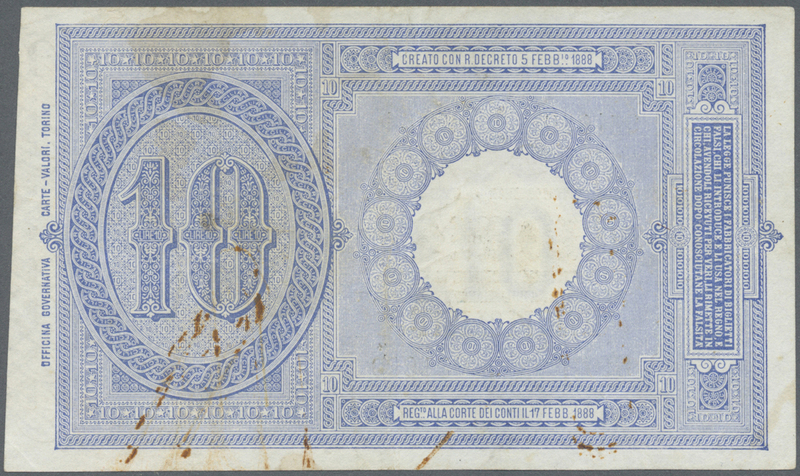 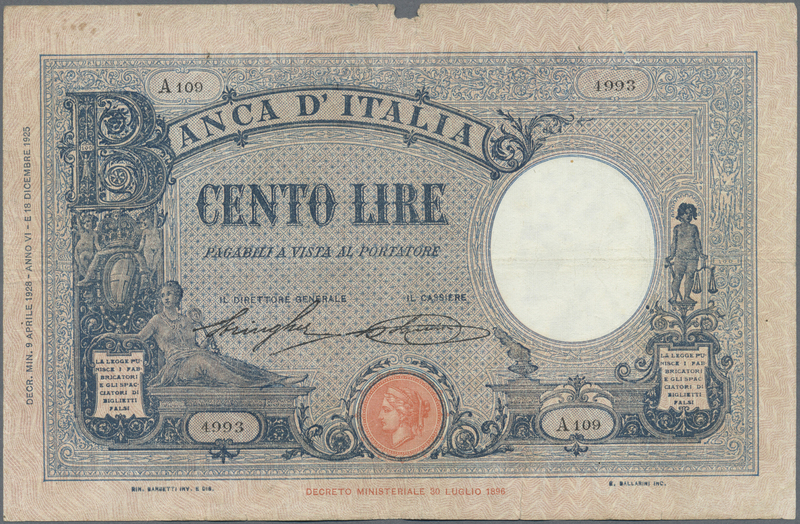 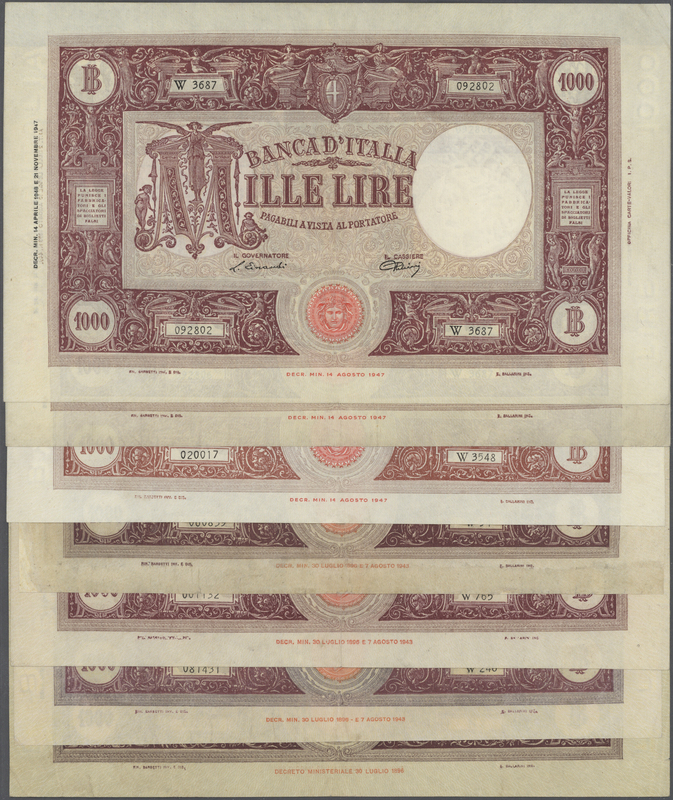 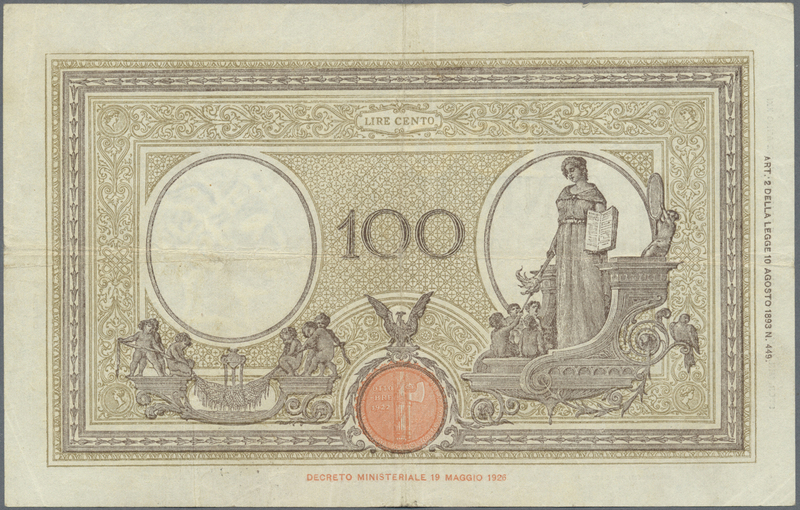 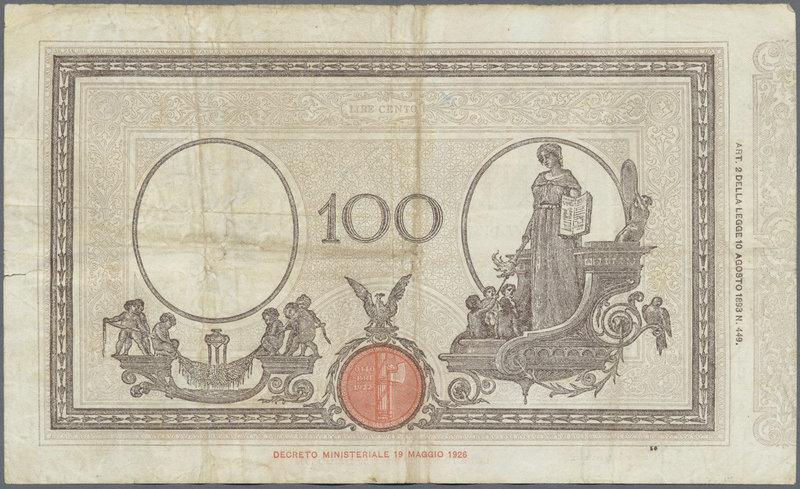 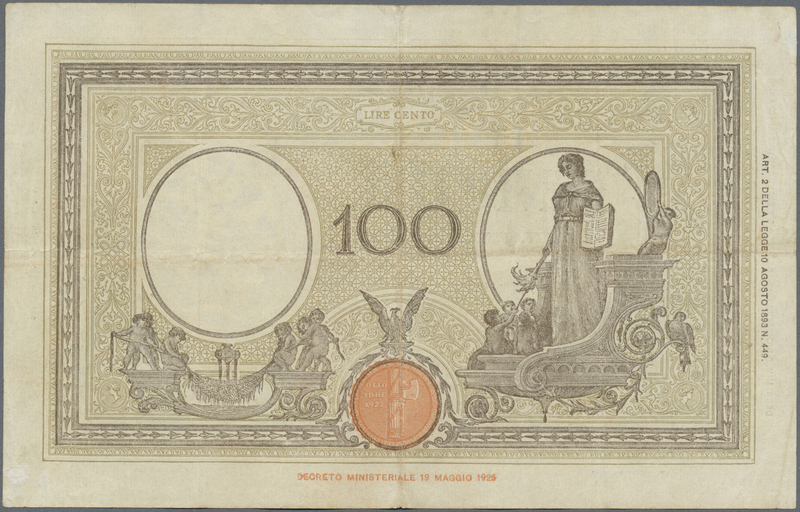 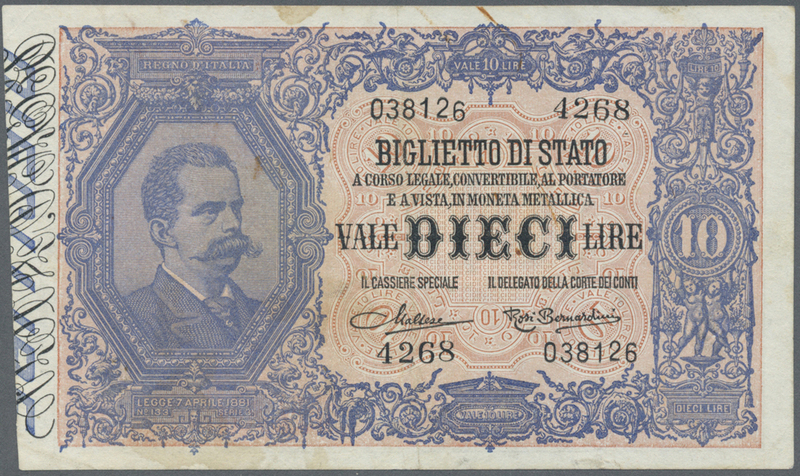 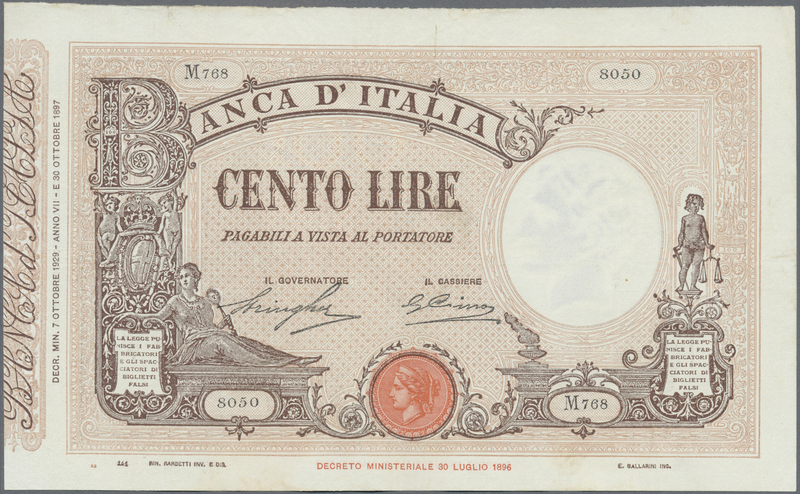 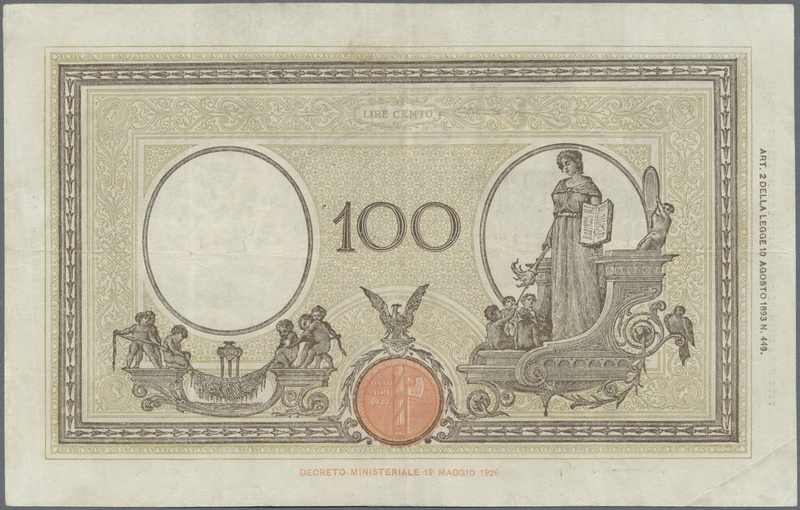 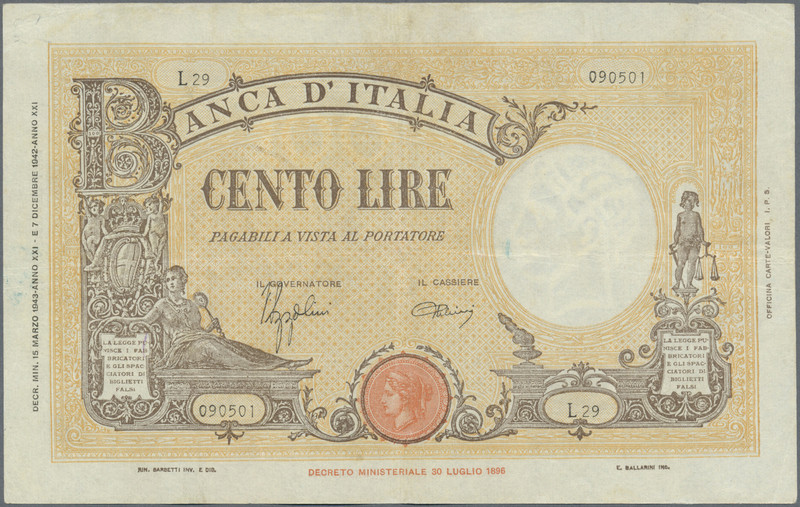 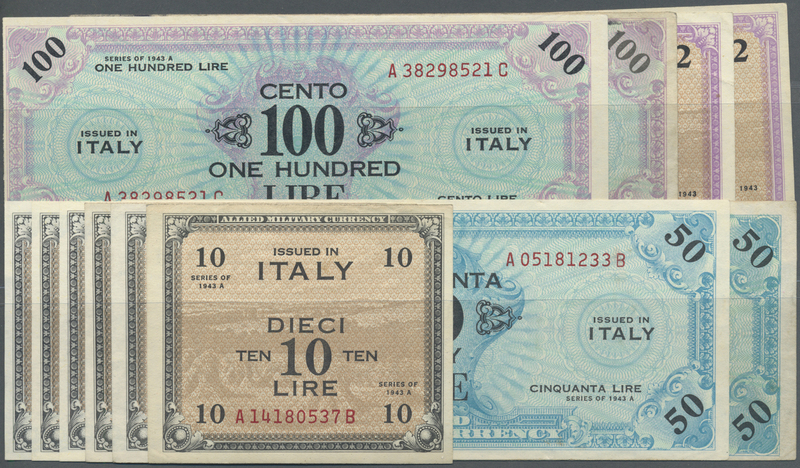 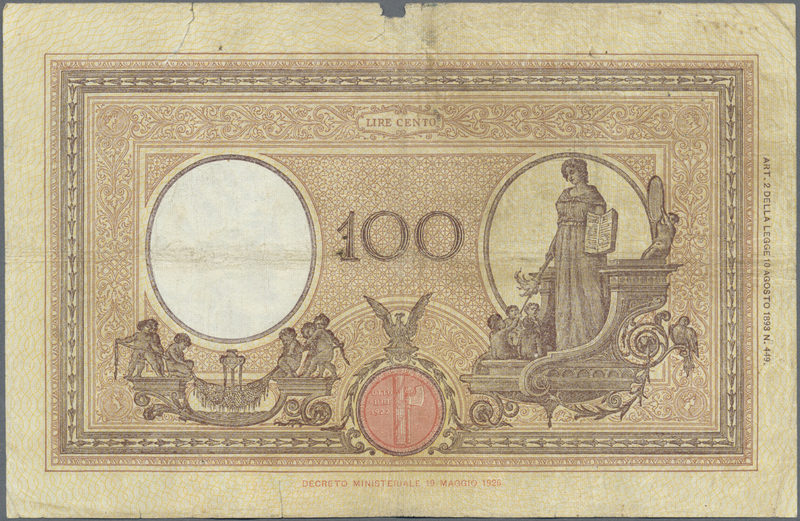 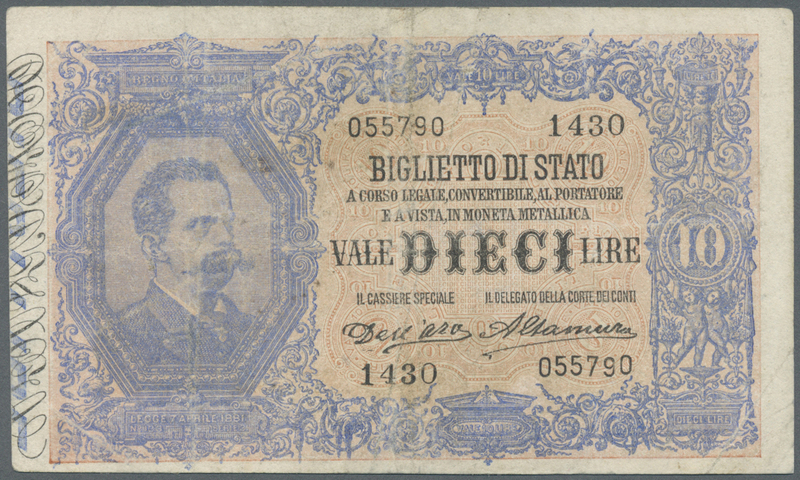 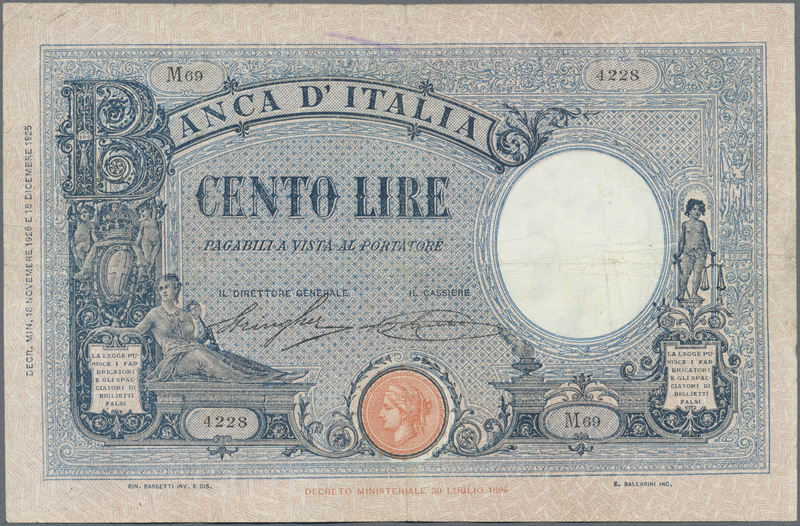 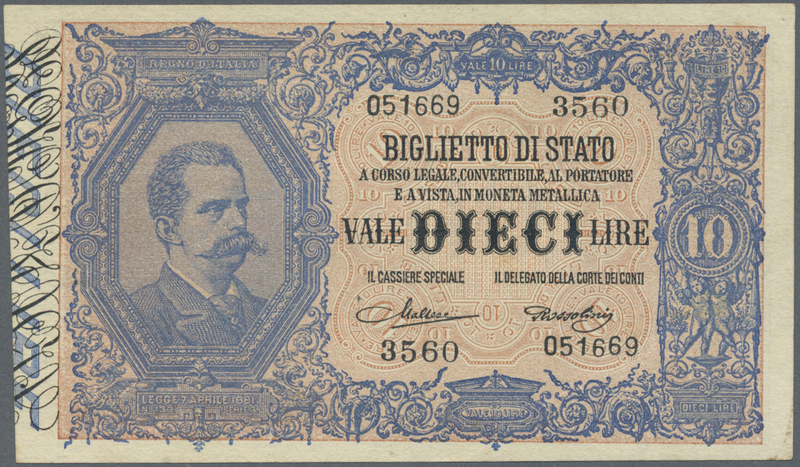 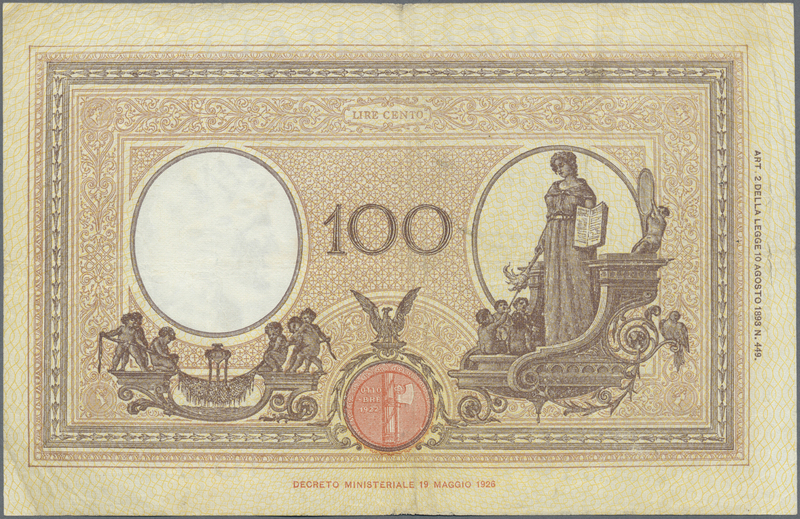 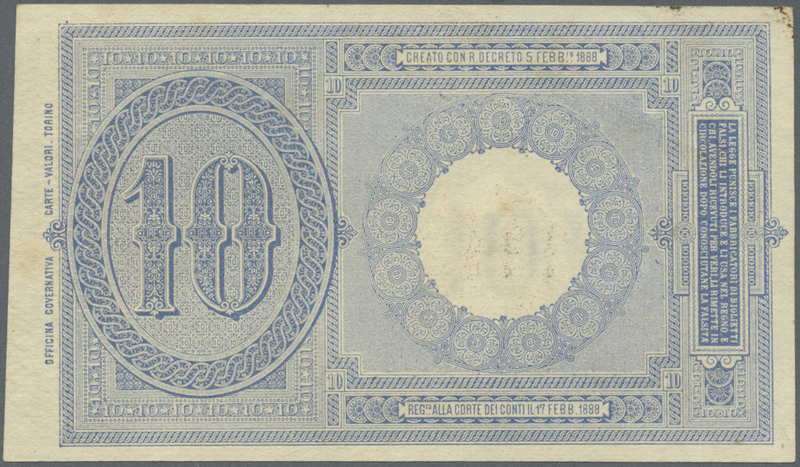 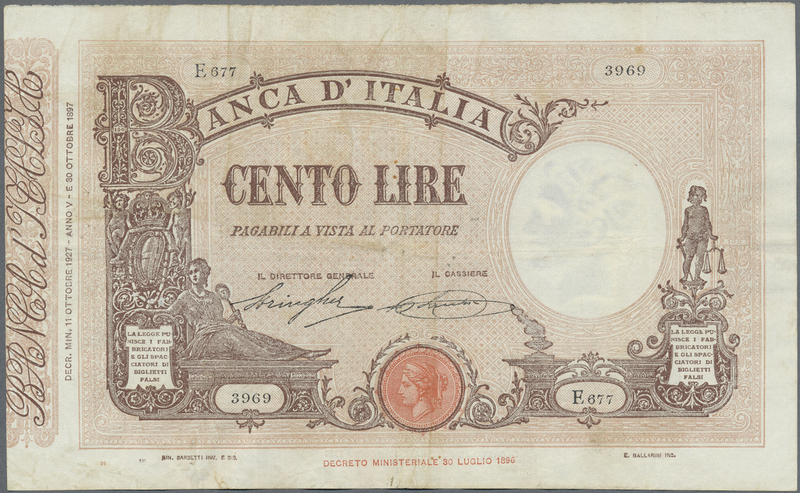 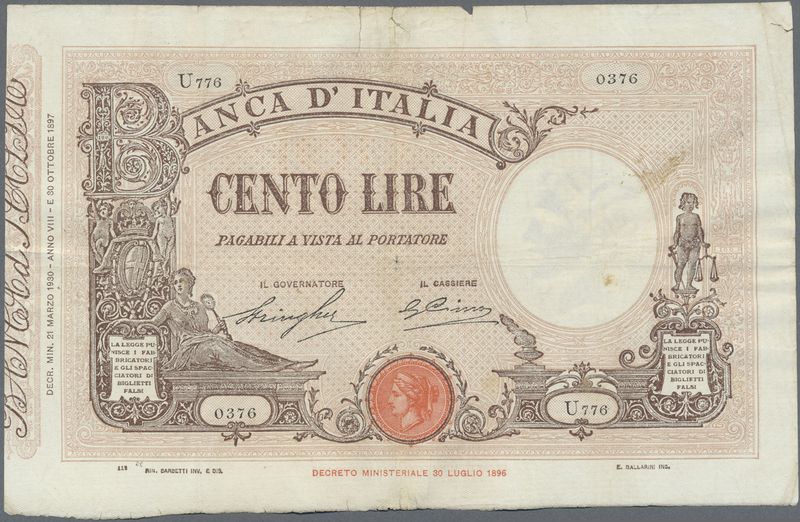 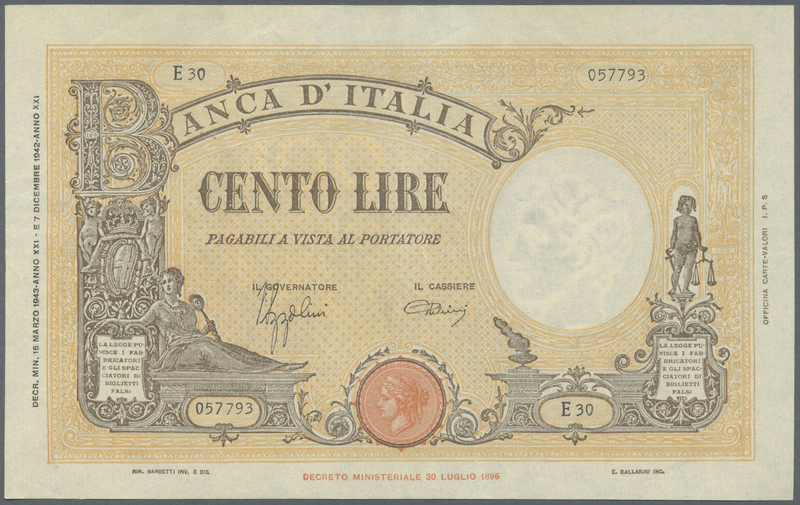 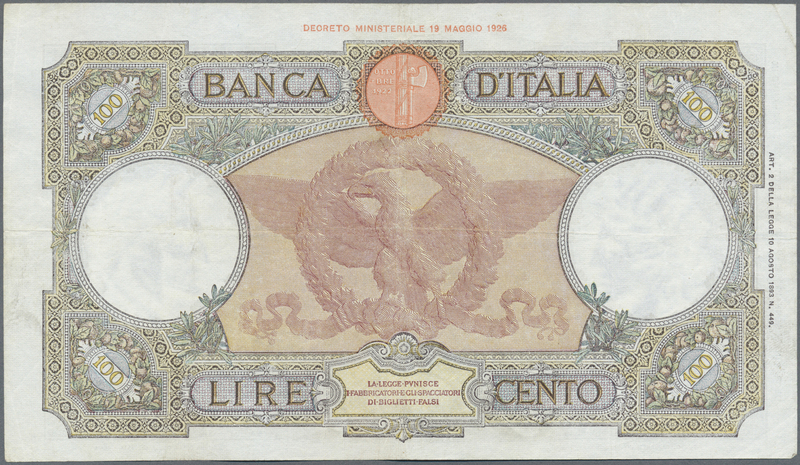 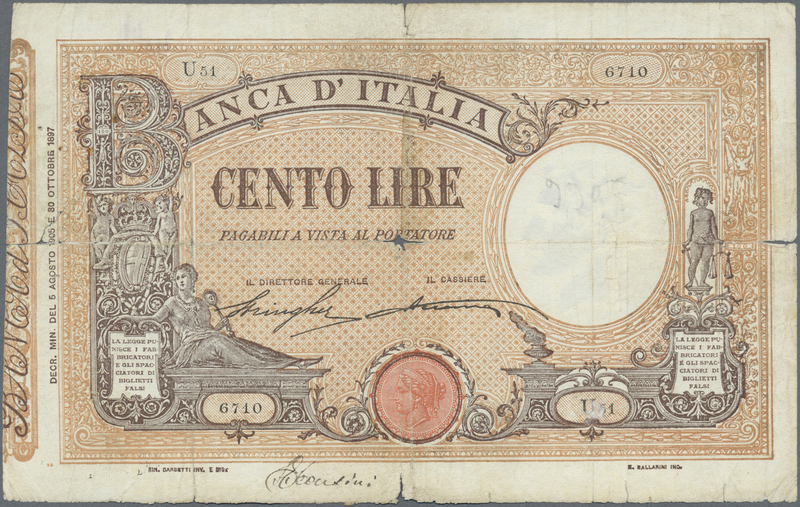 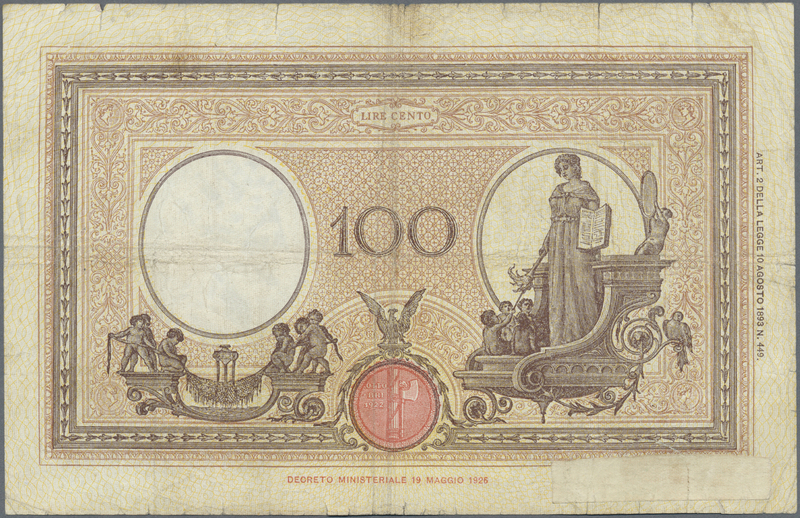 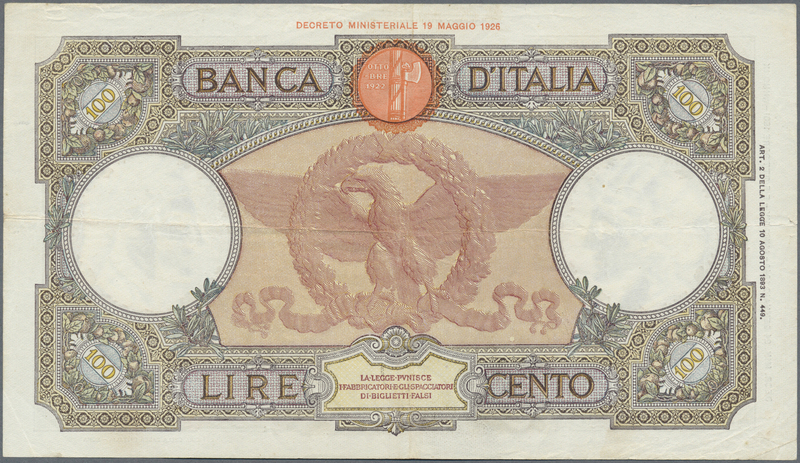 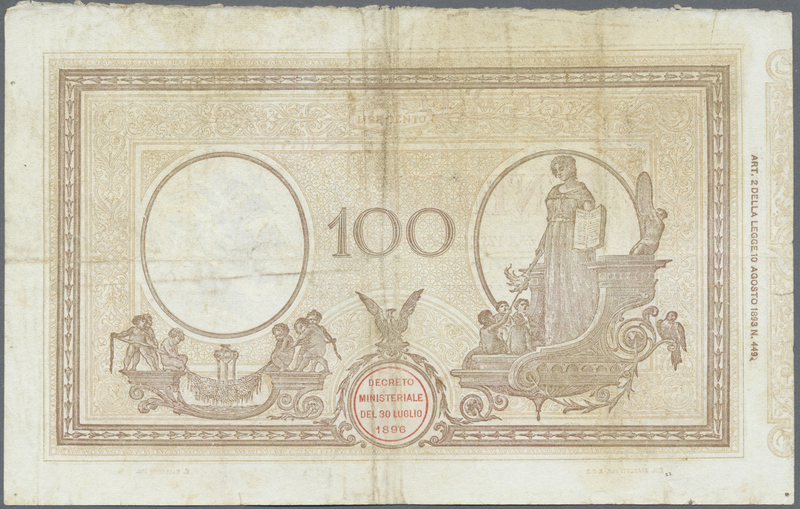 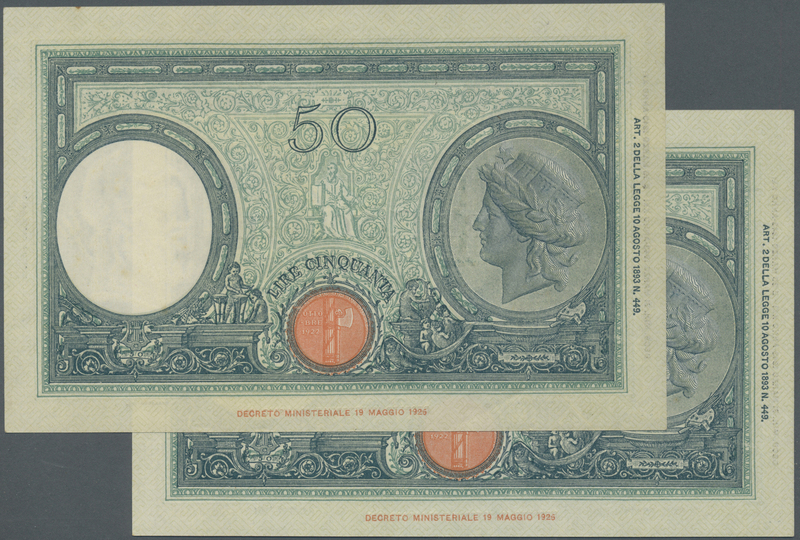 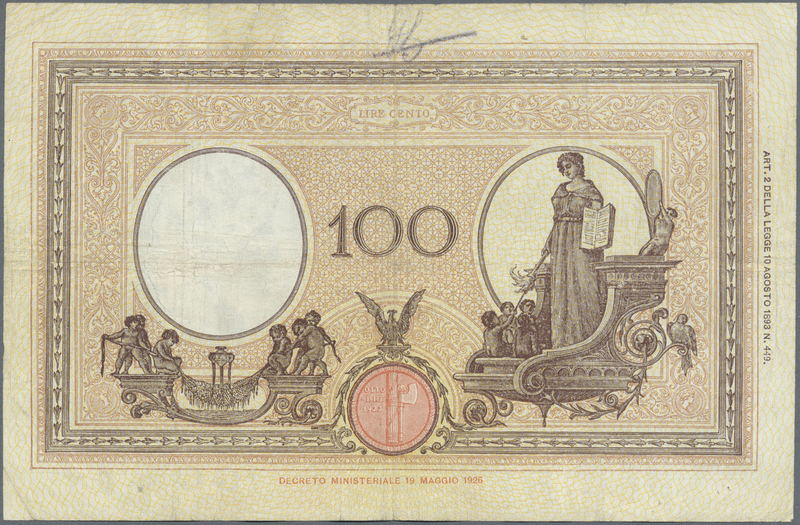 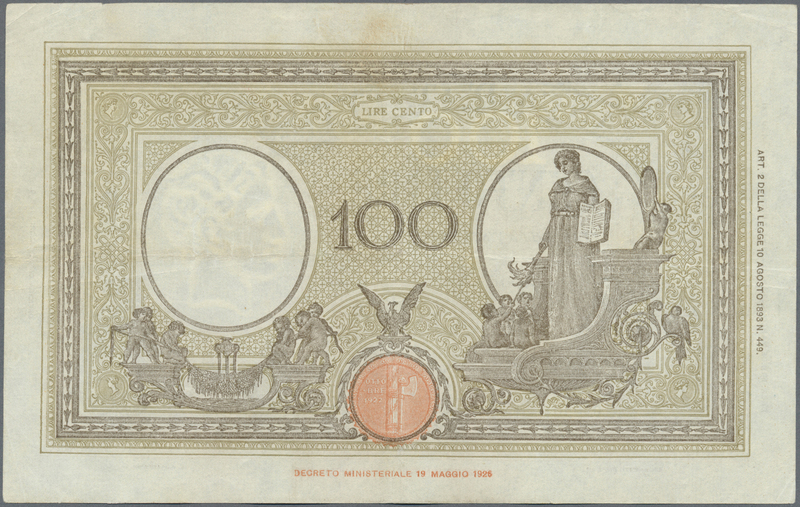 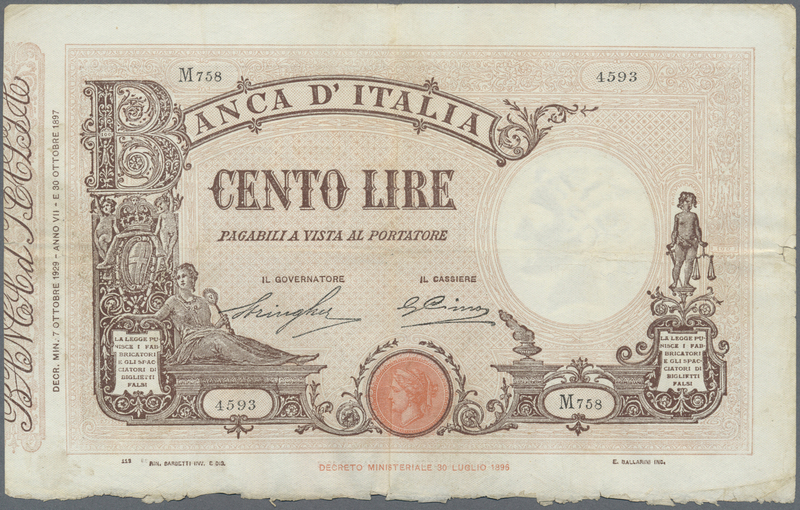 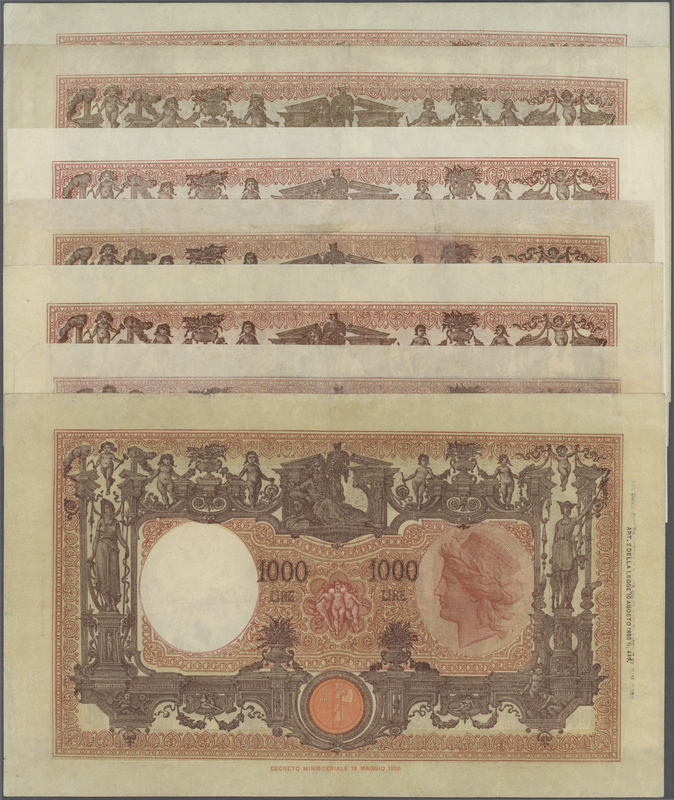 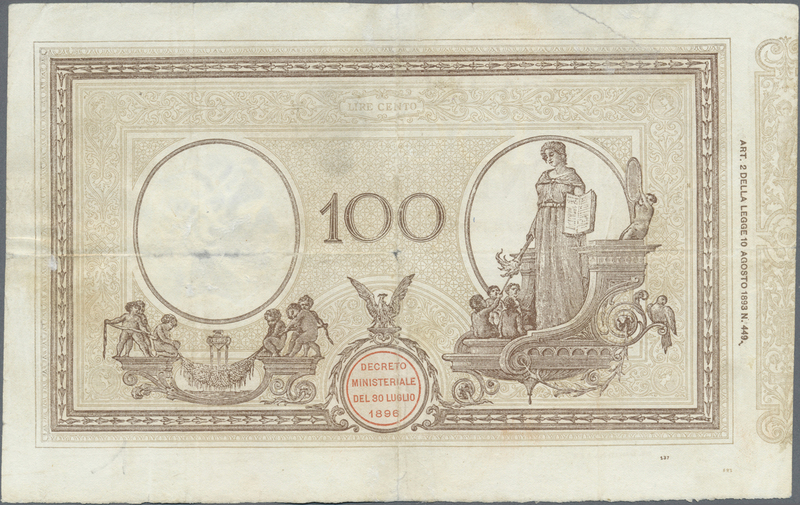 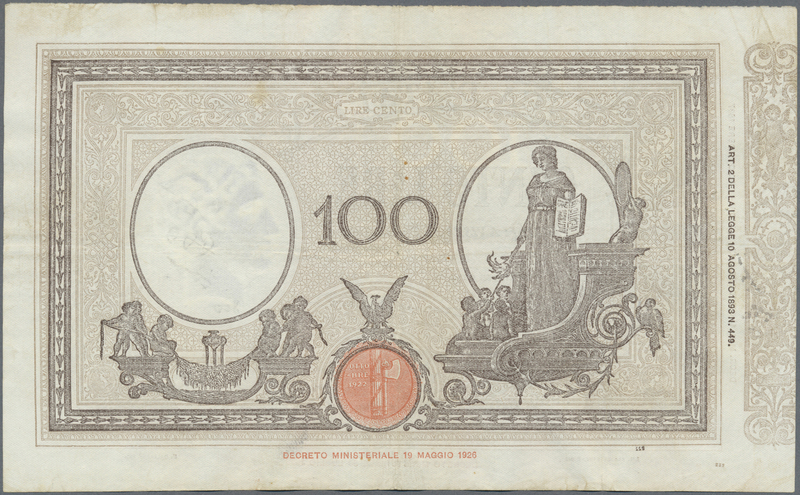 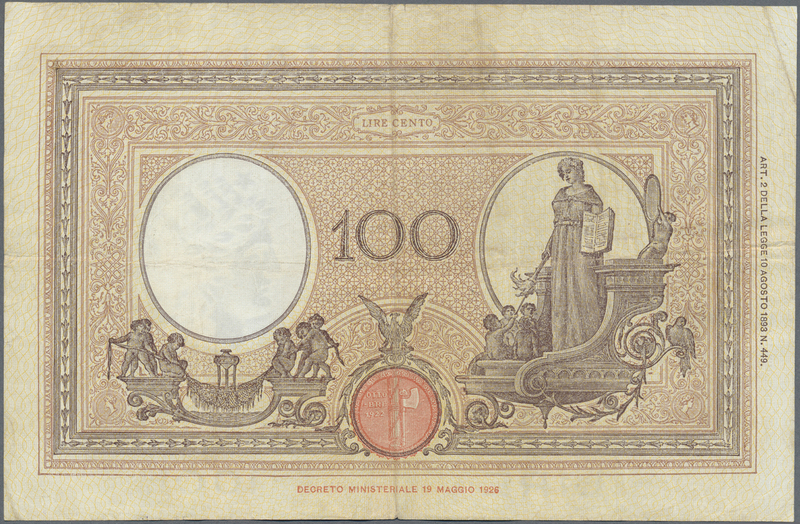 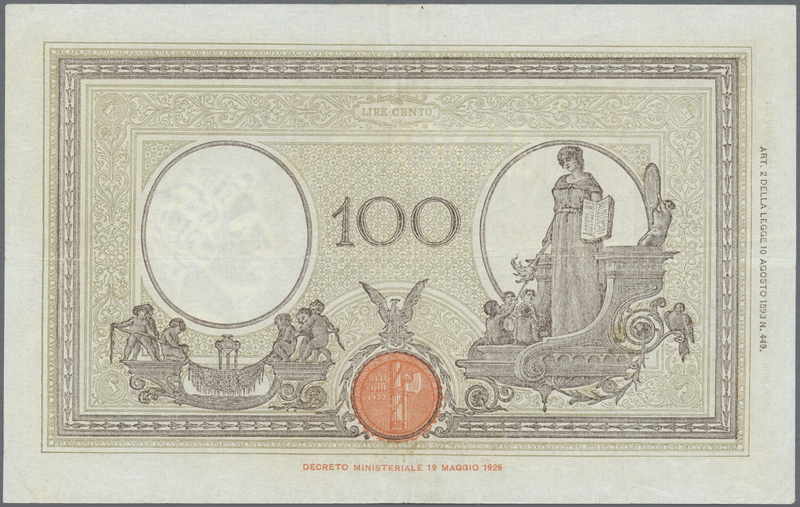 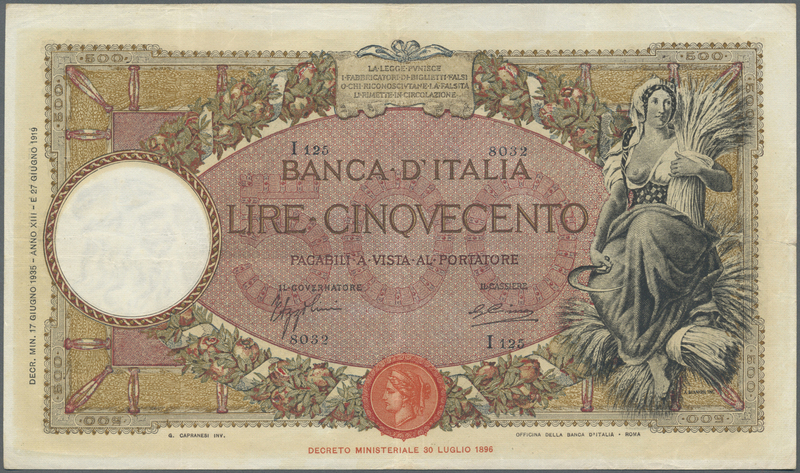 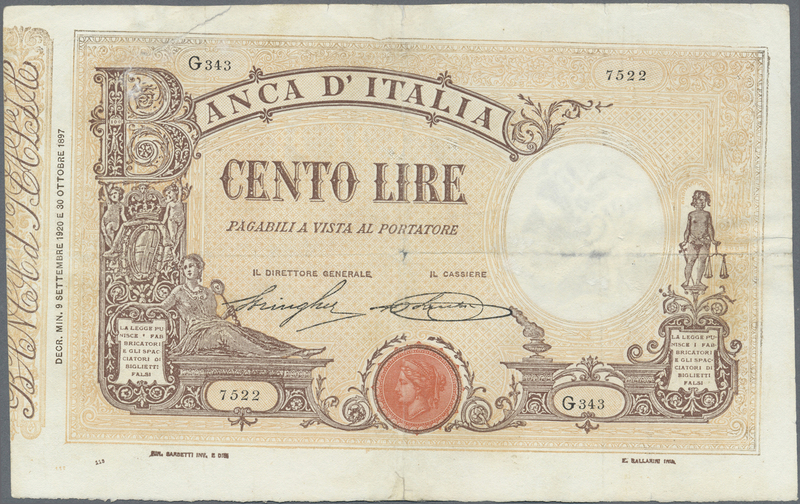 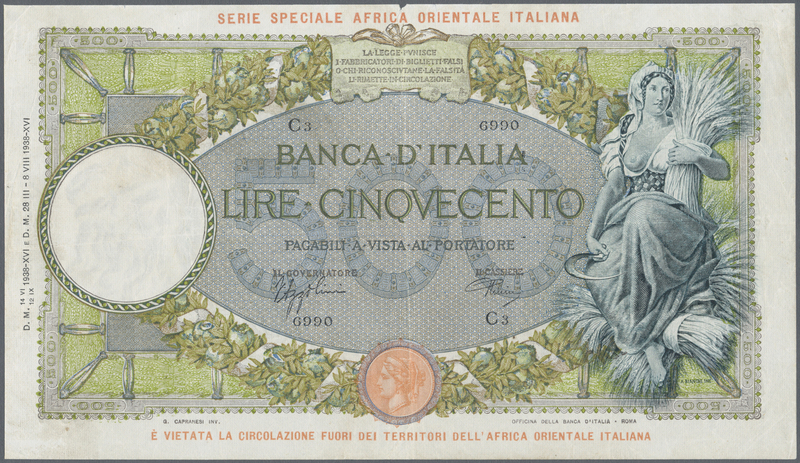 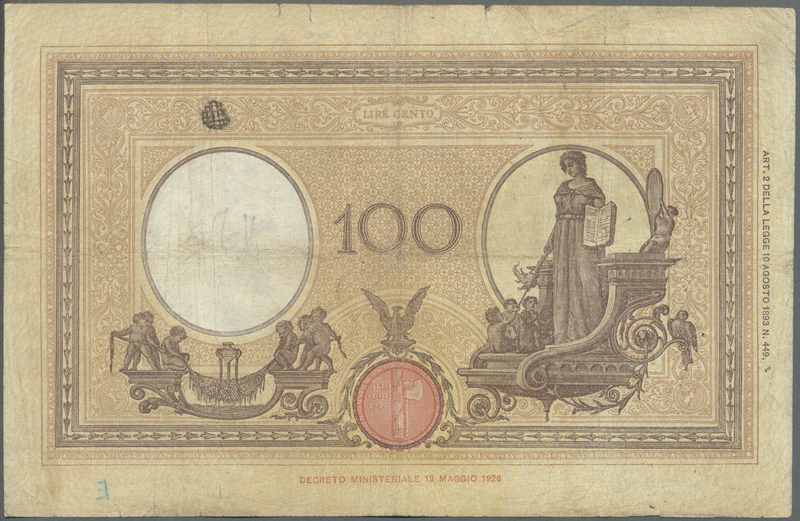 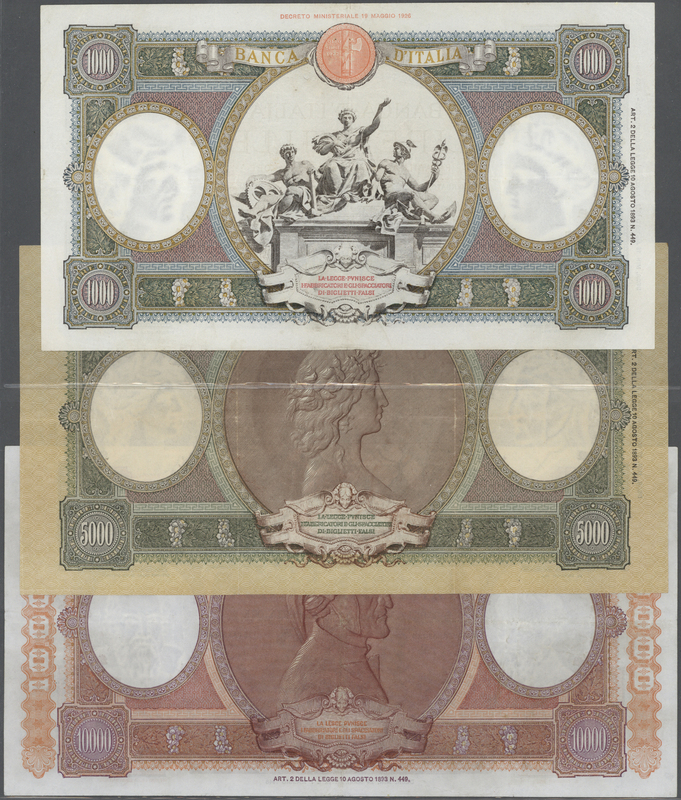 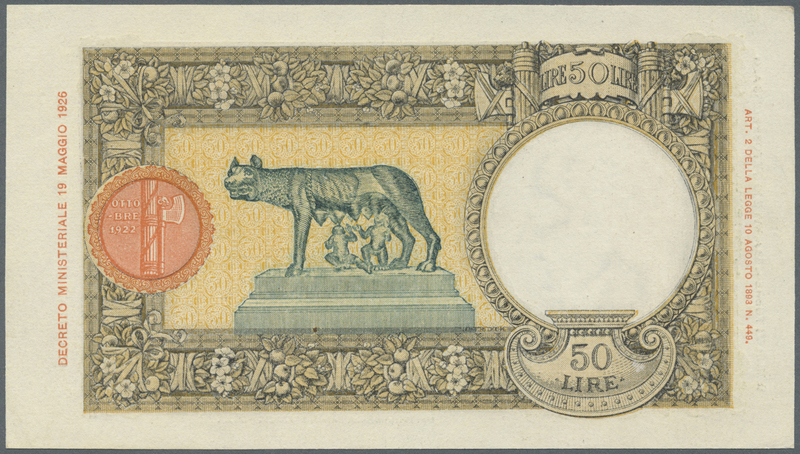 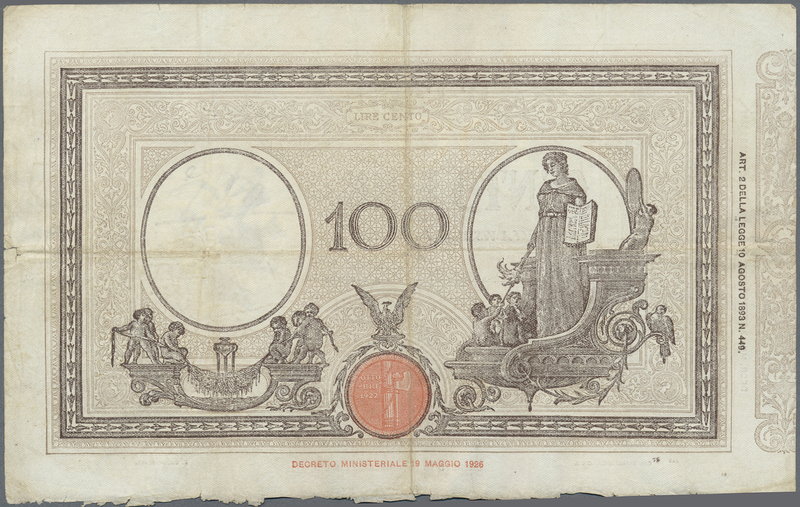 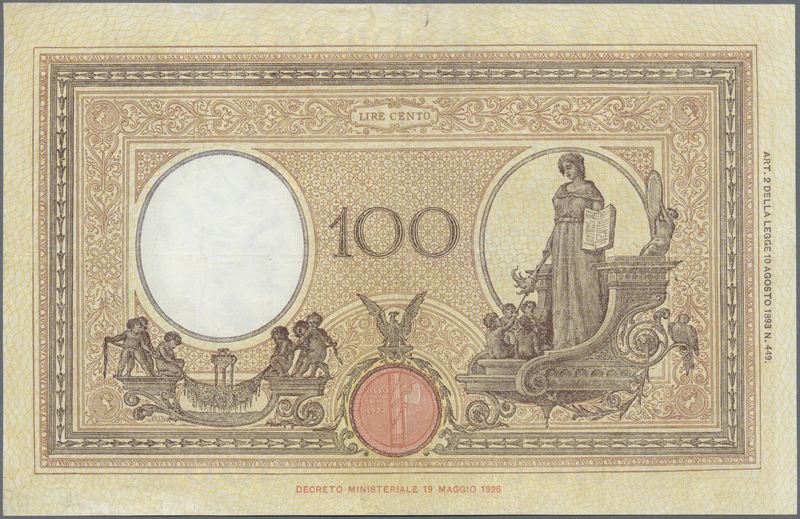 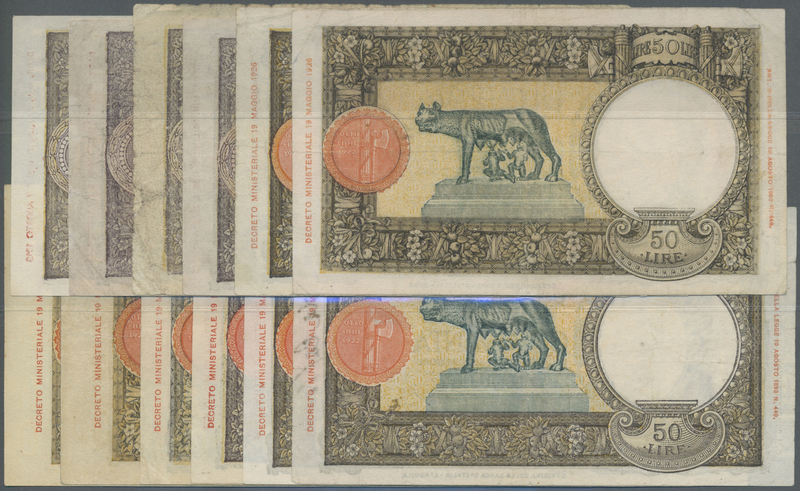 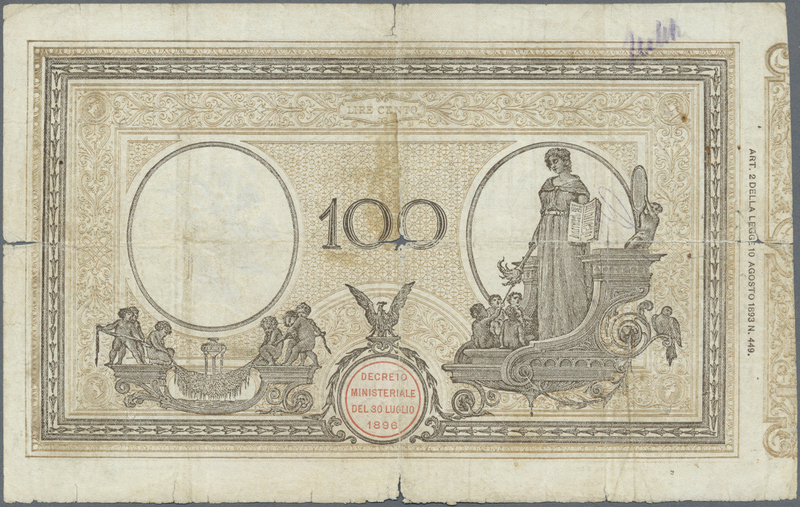 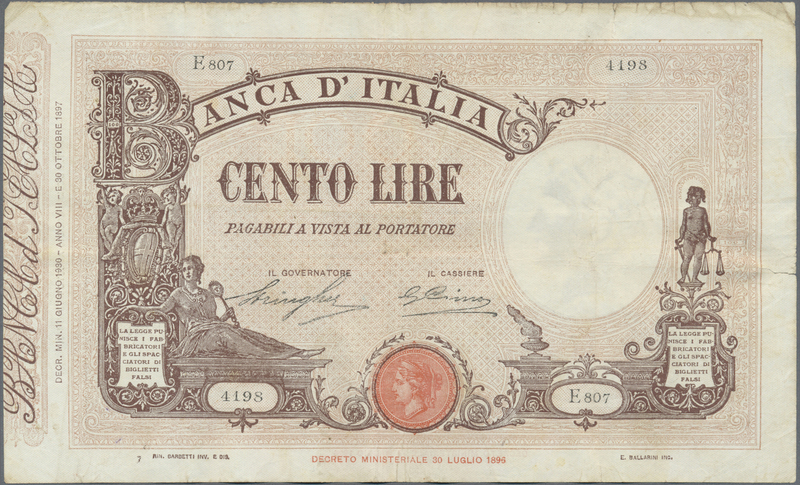 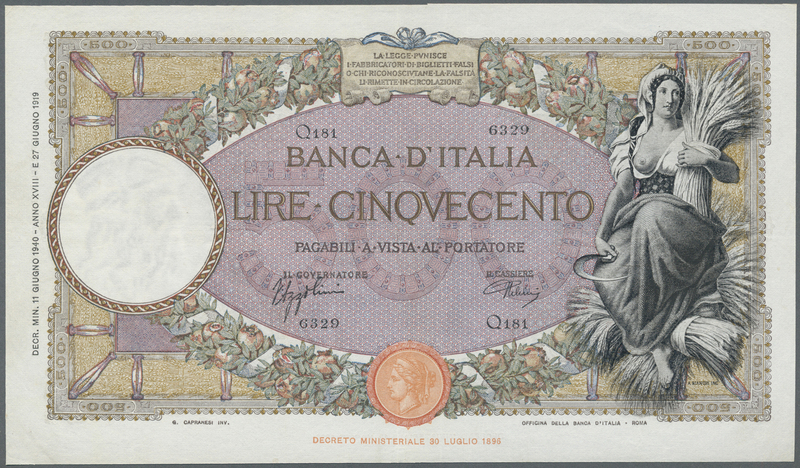 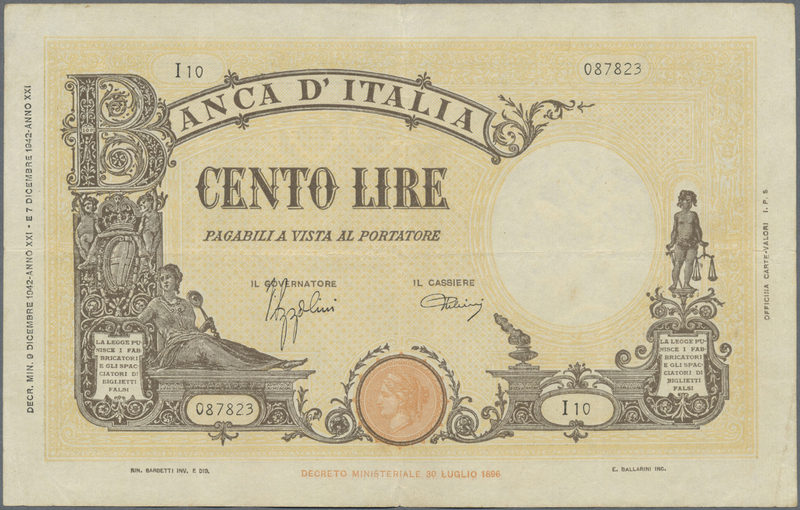 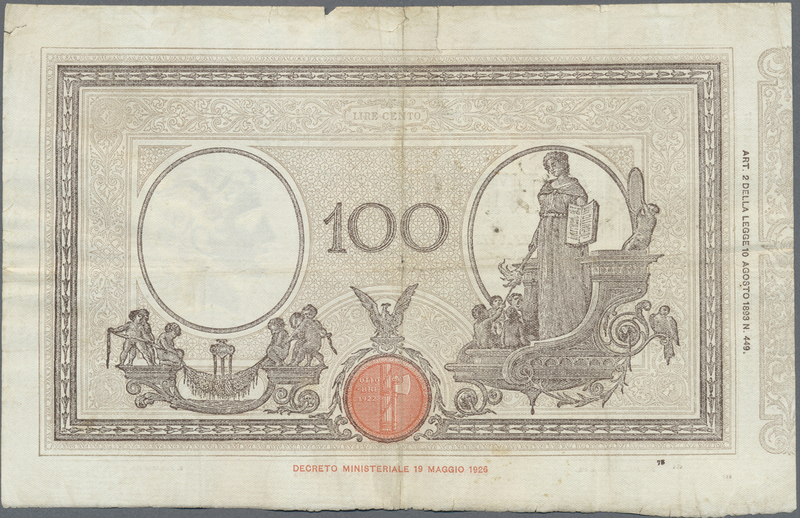 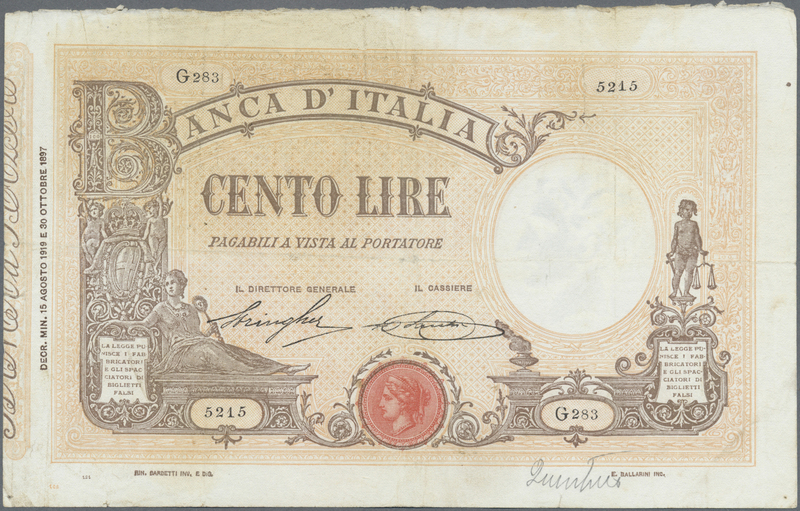 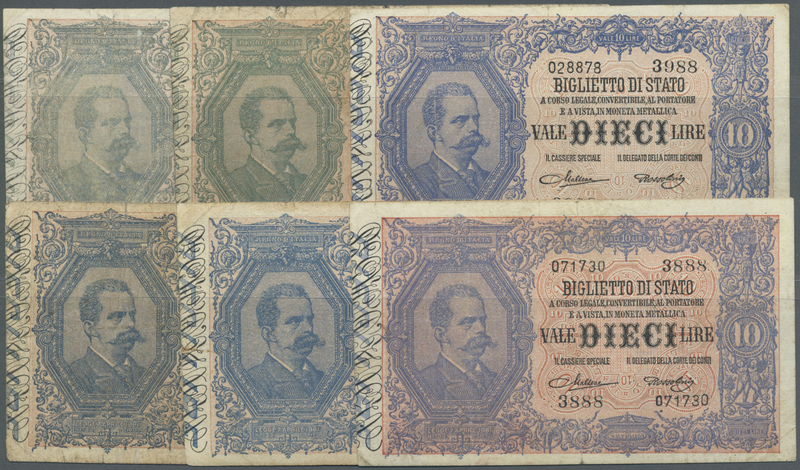 1825 Pick 59 100 Lire 1943 P. 59, light center fold, pressed but still very strong paper with crispness, no holes or tears, no stains, bright colors, condition: pressed XF. 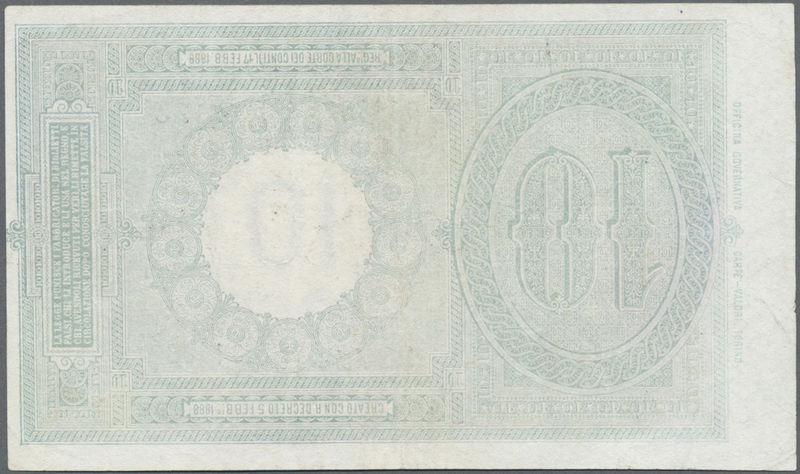 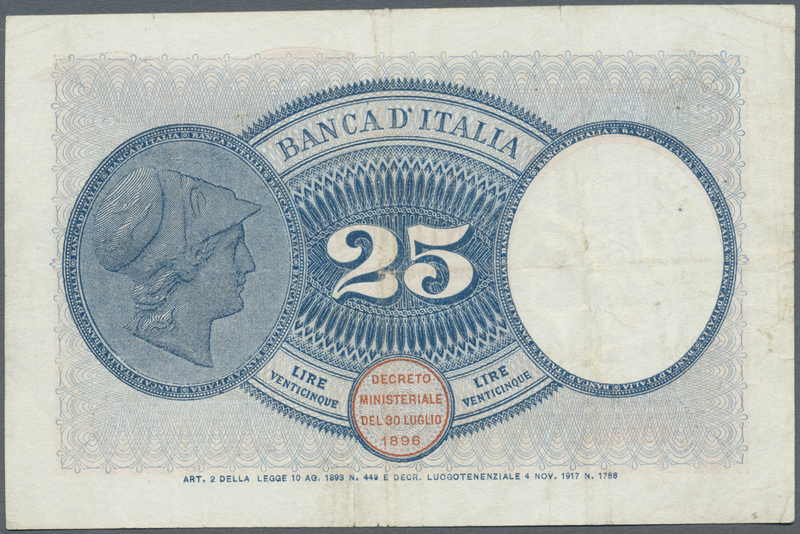 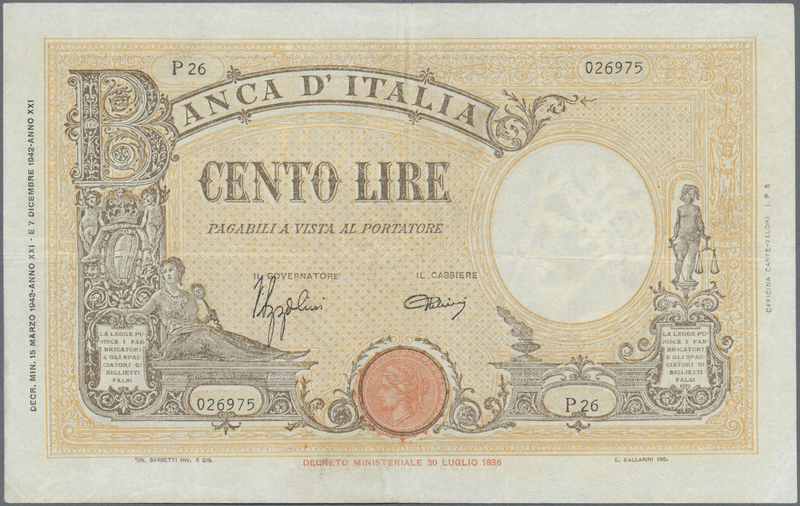 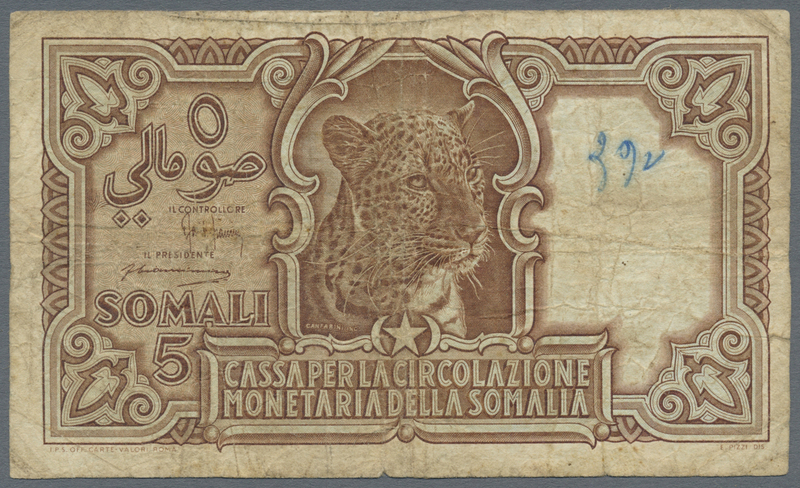 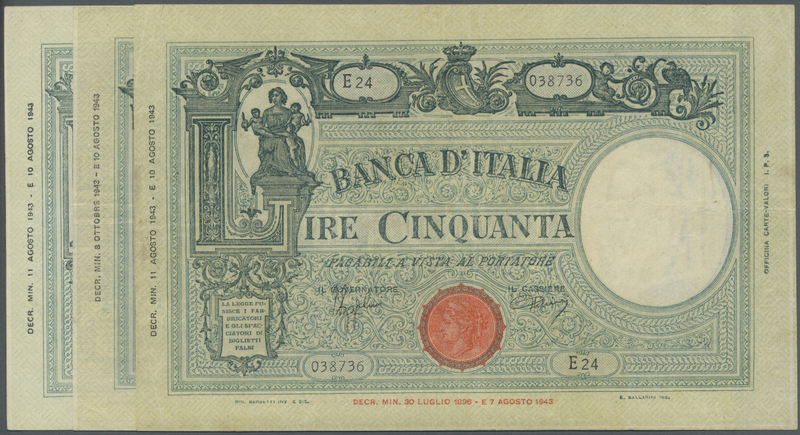 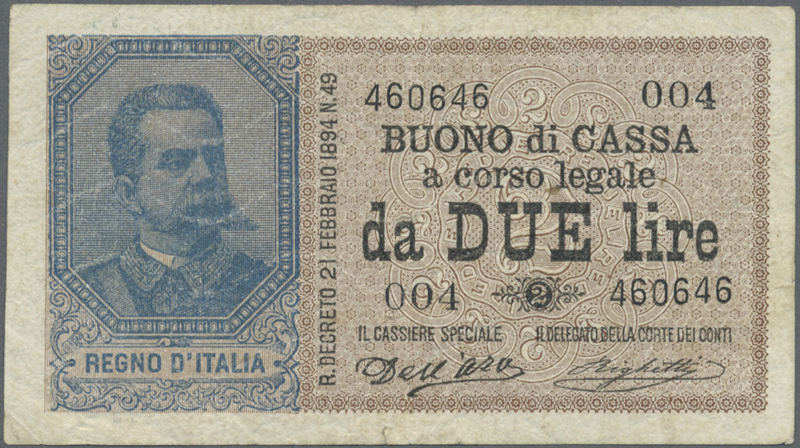 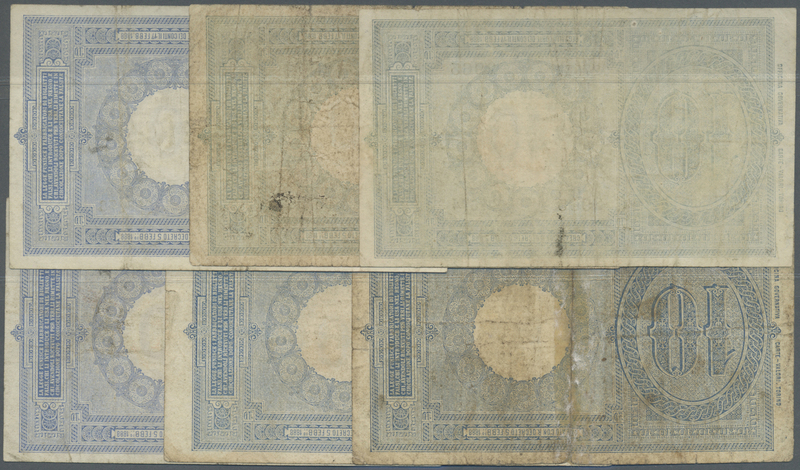 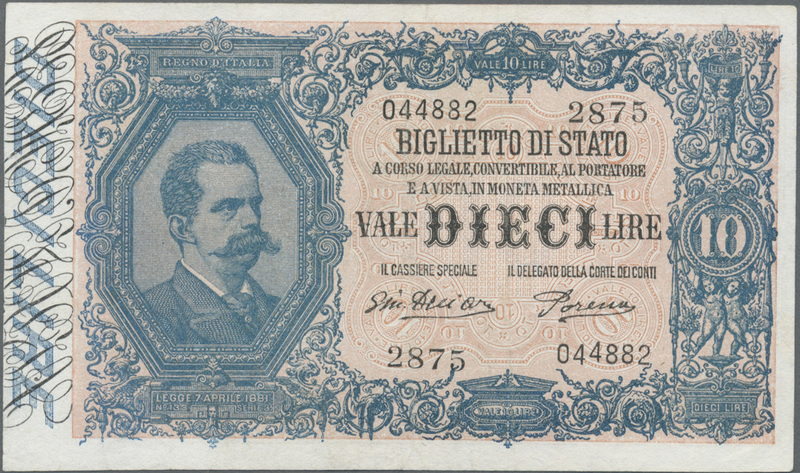 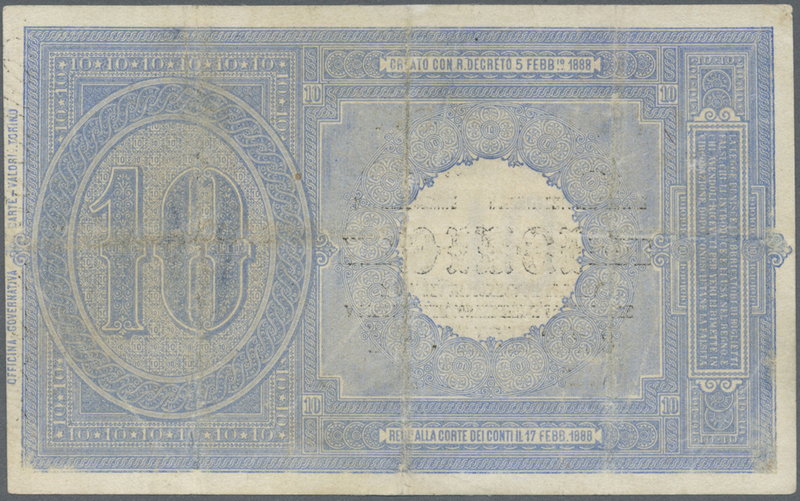 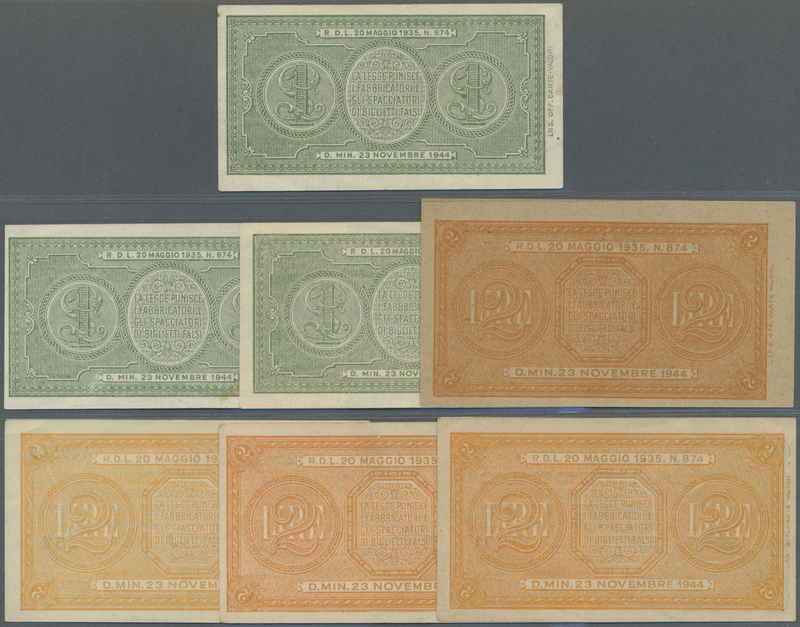 1826 Pick 62 1000 Lire 1943 P. 62, no visible folds in paper, light stains at borders, no holes or tears, crispness in paper, original colors, condition: XF+ to aUNC.